There is nothing like the outdoors of Franklin County! From fishing in the Falling Spring or Little Antietam to hiking the Appalachian or Tuscarora Trails, golfing on one of our challenging or award-winning golf greens, kayaking on the Conococheague, or stepping outside your comfort zone for a breathtaking skydive, Franklin County is home to great outdoor fun and relaxation. 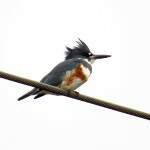 NEW: Out of the Ore: Birds & Bloom Walking & Birding Trail – Please see below or download here. Ask any avid fisherman why he enjoys fishing in the waterways of Franklin County, and he might tell you it is because he has so many different spots to fish. “The sheer volume of water that’s available in this part of the state compared to the population is astounding,” explains George Hammond of Custom Tied Flies and Guide Service. Hammond points out that there are four creeks within 25 miles of Chambersburg which are open year-round. These include the Falling Spring, the east branch of the Antietam Creek, a piece of the Big Spring near Newville, and the Green Spring close to Newburg. While the Conococheague Creek and the Conodoguinet Creek aren’t open for fishing every month of the year, these bodies of water do offer a wide variety of fish for enthusiasts to set their sights. Bluegills, small-mouth bass, large-mouth bass, and plenty of trout–including wild rainbow, wild brown and Brook can be found swimming across Franklin County. If fly fishing is your preference, experts say the county is a prime location for that as well. “The Cumberland Valley has some of the classic limestone springs of the United States,” says is Dusty Wissmath of Dusty Wissmath’s Fly Fishing School and Guide Service. “It’s where many of the modern fly fishing techniques and flies are developed. It is a well-known area and holds some great fishing. Many Americans may be familiar with the Appalachian Trail, stretching a total of 2,181 miles from Maine to Georgia. Of those miles, 232 pass through the state of Pennsylvania, where several hiking experts and enthusiasts will tell you the magnificence of the trail is most apparent. An avid hiker himself, Patterson is familiar with the ever-changing terrain of the trail. Park officials in South Central Pennsylvania provide hikers in the area with plenty of places to embrace the scenic beauty. The trail passes over South Mountain in Franklin, Adams and Cumberland Counties, while also making its way through two of Pennsylvania’s most popular state parks, Caledonia State Park and Pine Grove Furnace State Park. The Pennsylvania Forest Fire Museum can be found at Caledonia, and Pine Grove Furnace is home to iron furnace ruins from the American Revolutionary War, as well as the Appalachian Trail Museum. In the 1800’s, the natural resources of South Mountain fueled the iron ore industry. 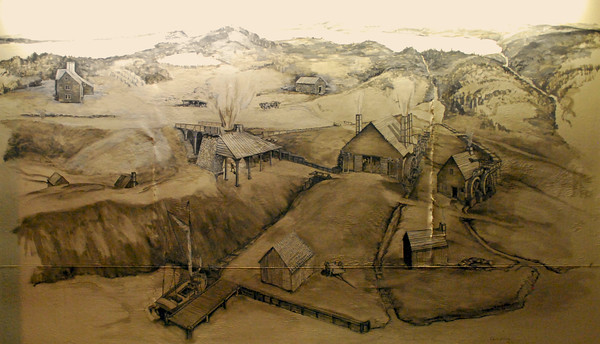 Plentiful timber, water and iron ore kept the furnace stacks of South Mountain working day and night. For decades, the iron industry stripped the life from South Mountain, leaving a blank landscape, void of natural resources and habitats. Out of the iron ore industry, the Pennsylvania conservation initiative took shape. 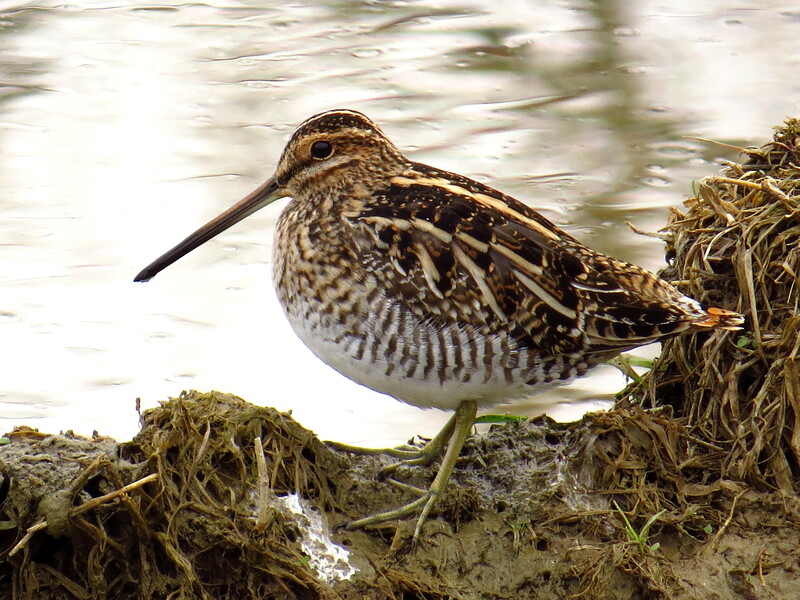 Today, the furnace site is home to hundreds of bird, wildlife, insect, tree and plant species. South Mountain is an an “interstate greenway” – a large, linear corridor six to seven miles wide that links Pennsylvania with southern natural areas. It extends about 40 miles in a northeast to southwest direction connecting Adams, Cumberland, Franklin, and York Counties. 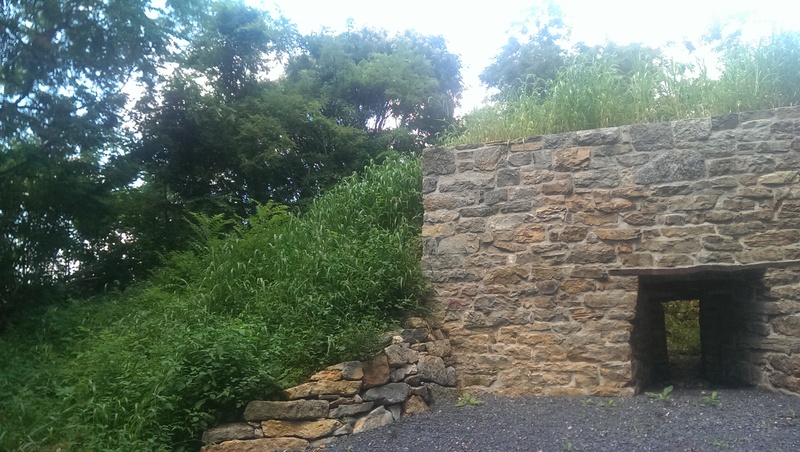 From the 1700s through the 1800s, South Mountain offered the resources needed to produce pig iron. Caledonia Ironworks, Pine Grove Furnace, and Mont Alto Ironworks were three dominant operations fueled by South Mountain resources. The charcoal needed for the manufacture of iron ore required approximately one acre of timber daily to keep the furnace functioning. The wood was slow-cooked over several days to create charcoal, which was used to fuel the furnaces that smelted the iron from the iron ore. The forests of the region were clear cut every 20 to 25 years. 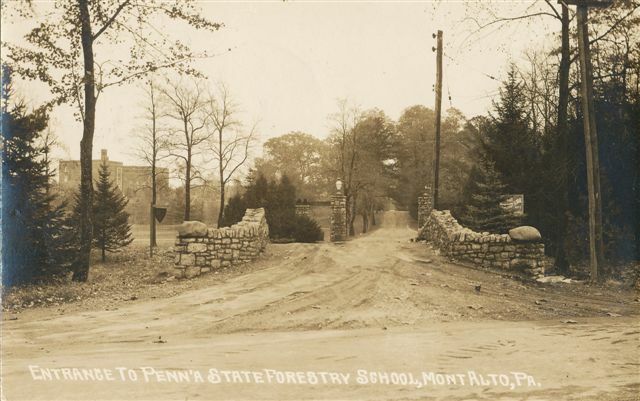 Forestry School in Mont Alto, now Penn State Mont Alto. The campus is less than half a mile from the Birds & Blooms walking trail. Pine Grove Ironworks began operating as early as 1770, Mont Alto Ironworks commenced in 1805, and Caledonia Ironworks began operations in 1837. By the turn-of-the-twentieth century , the forests of South Mountain were over-logged without consideration of replenishing the forest or keeping the habitat alive. Iron-production left the old-growth forests of South Mountain a lifeless wasteland and a prime example of Pennsylvania’s need for conservation. Sylvania is a Latin name, meaning from the woods, and pairs with the state’s founder [William] Penn to create the name Pennsylvania. Forests were the hallmark of the state. In 1870, Pennsylvania led the nation in logging. Over the next thirty years, the deforestation continued, and by 1900, Penn’s Woods were literally cut in half. Along with the deforested mountainsides came wildfires, flooding , erosion, and heavy loads of sediment dropped in waterways. 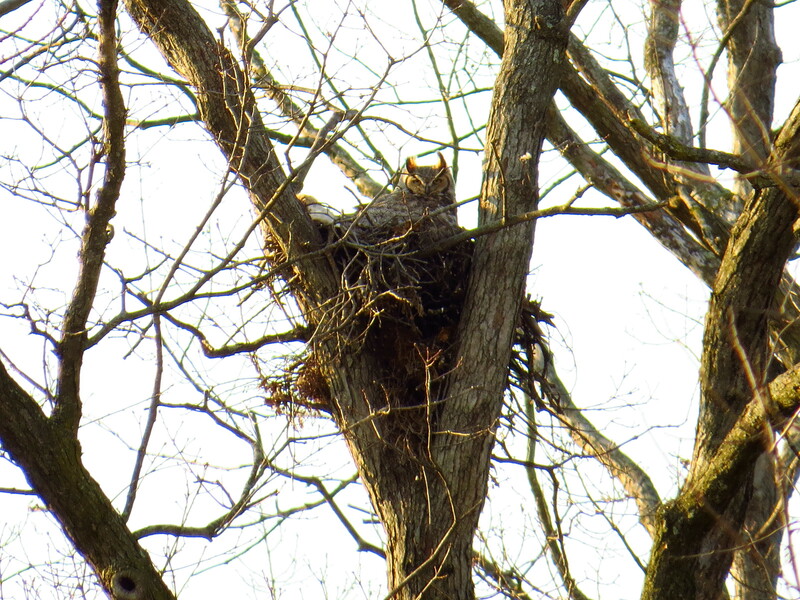 Naturalists became activists, sounding an alarm to the public and leaders of Pennsylvania, not only making them aware of the loss of the nature resources and habitats but the future loss of timber-related industries. 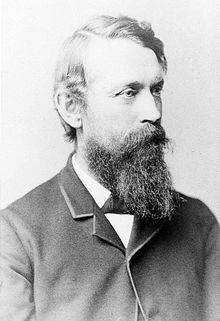 Leading the effort was Joseph Rothrock, known today as the “Pennsylvania Father of Forestry.” Rothrock was a medical doctor and botanist and employed a scientific approach to studying plant and animal life. Over more than two decades, he cataloged species of animals and plants, studied forests around the world, and traveled across Pennsylvania to see firsthand the condition of forestlands. Rothrock realized the need to regrow the forests and create environmentally healthy methods to grow and cut the timber of future forests. In 1895, Joseph Rothrock was appointed Pennsylvania’s first Commissioner of Forests. Pennsylvania was focused on restoring its lands and began purchasing available acreage for stewardship and reforestation. The land of the former Mont Alto Ironworks, and Caledonia Ironworks were among the purchased land. In 1902, Mont Alto Ironworks became a state park for the leisure and recreation enjoyment of the citizens and the protection of the state’s natural lands and watersheds. Joseph Rothrock was convinced the way to ensure the sustainability of the forests, a state forestry school was needed. As he continued to secure lands, he set about to create a school to train foresters and unable to convince another to open a school, he accepted the “first class” of thirteen foresters at Pennsylvania State Forestry School in Mont Alto, PA in September 1903.
forest fires, build fire roads, and develop the forest tree nursery and arboretum on the 33,000-acre campus. 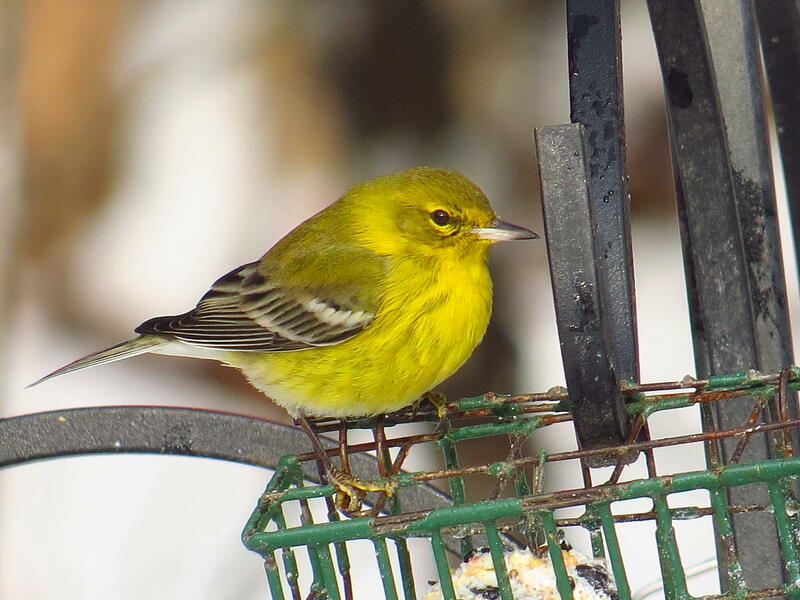 Today, the Pennsylvania Forestry School is the Mont Alto Campus of Penn State–less than half a mile from the Out of the Ore: Birds & Bloom Walking Trail. Pennsylvania’s South Mountain forest has red oak, white oak, tuliptrees, red maples and hickories. Within the landscape is a unique pocket where northern and southern species live together in an area called “Meeting of the Pines,” which includes white, shortleaf, pitch, table mountain, and Virginia pines. The lower canopy of this forest includes mountain laurel, wild blackberry, and black huckleberry. 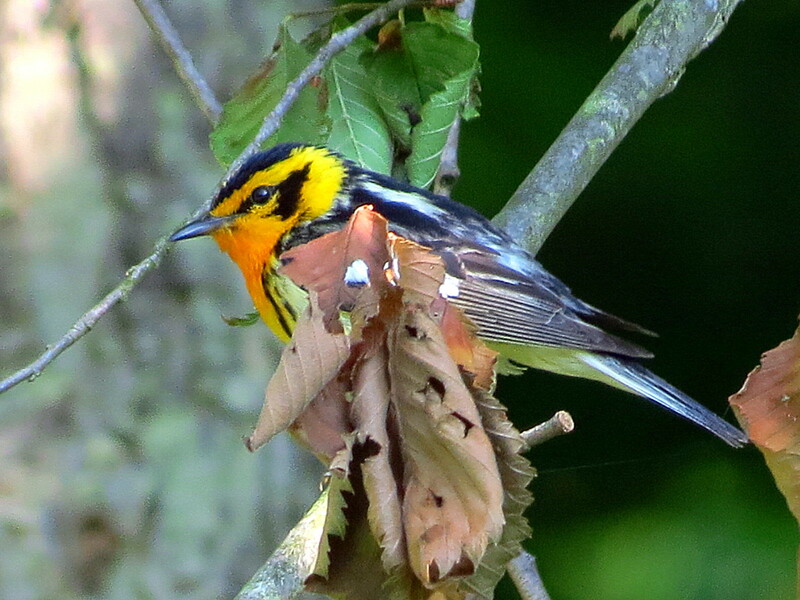 Humid summer temperatures create a thriving underbrush where insects are plentiful, attracting 47 species of birds year-round, documented by the local birding chapter, Conococheague Audubon, in the PA Migration Count and Christmas Count. These birds are all-black, including bill and legs. They are social, intelligent, and are known to chase away larger birds. 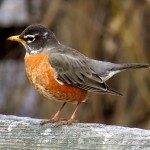 When flying, they rarely glide, instead continually flapping their wings. 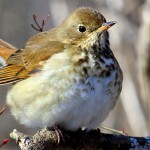 This large, assertive songbird is the largest member of the thrush family in North America. Under bellies are orange and wings are grey-brown. Females have paler heads. A patch of white can be seen on the lower belly and tail. 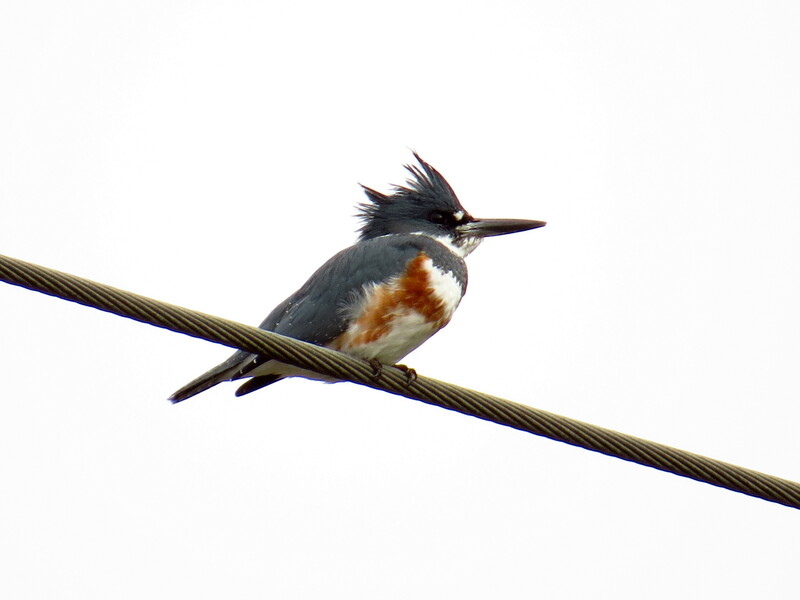 It has a large head with a ragged crest and is powder blue with a white chest. 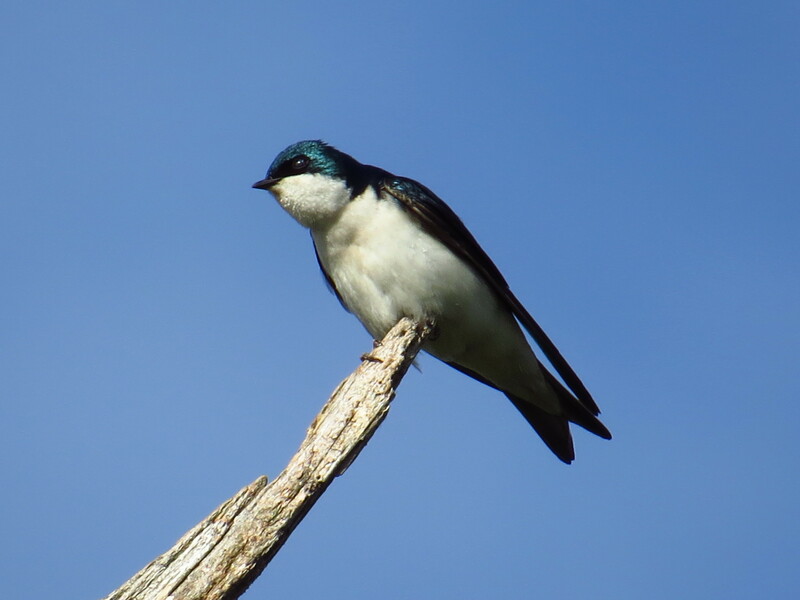 Males have a blue band across the chest. 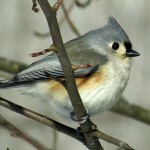 Females have a blue and brown band across the chest. 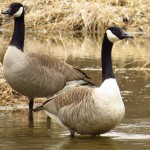 These birds are found near water. 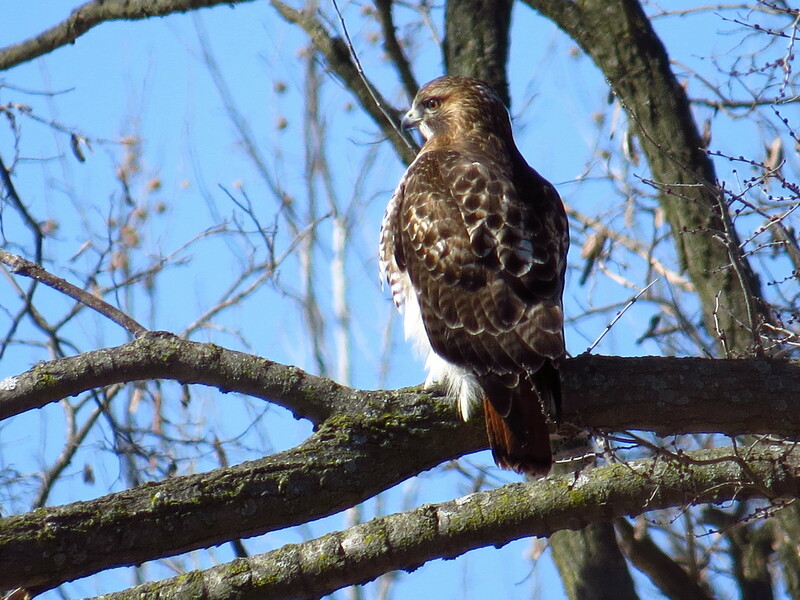 It is a large black raptor with rounded, white-tipped wings, short tail, and 5-ft. wingspan. 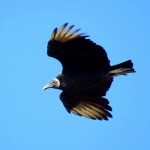 It often soars with other raptors and follows to carrion because it has a poor sense of smell. 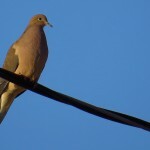 It is a very social bird with strong family ties. 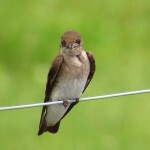 A tiny bird with a short neck, it has an oversized, round head and tiny body. 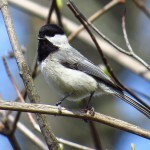 They have a black cap and ragged-edge black bib with white cheeks, gray and white wings, and a light beige, somewhat orange underbelly. They usually fly alone and have a “bouncy” flight. 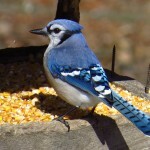 Another large songbird, bigger than a robin, has a bright blue crest, back and wings with a white face, black beak, and black markings. 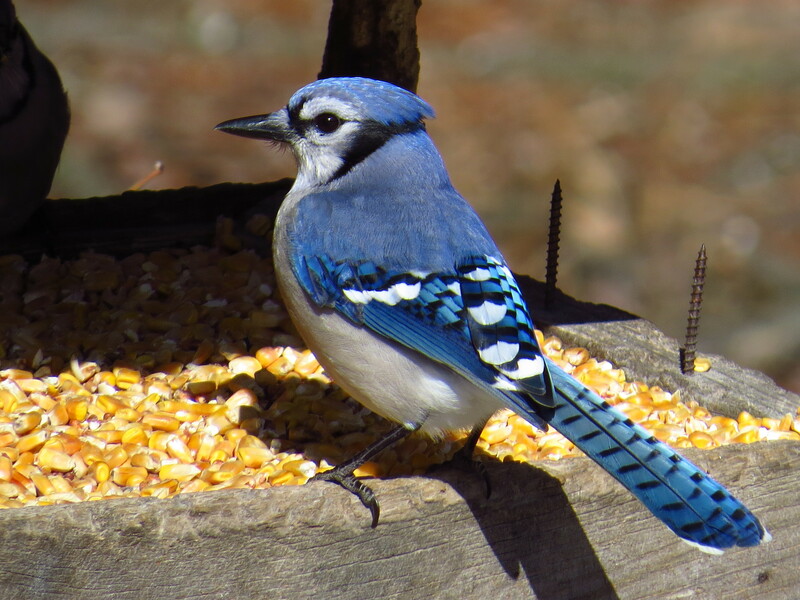 This bird has a loud, distinctive call and is fond of acorns. 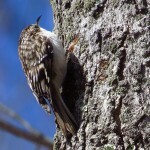 A tiny, brown and beige bird with a white or gray underbelly is seen on tree trunks, searching for insects in the bark with their slender, down-curved bill. 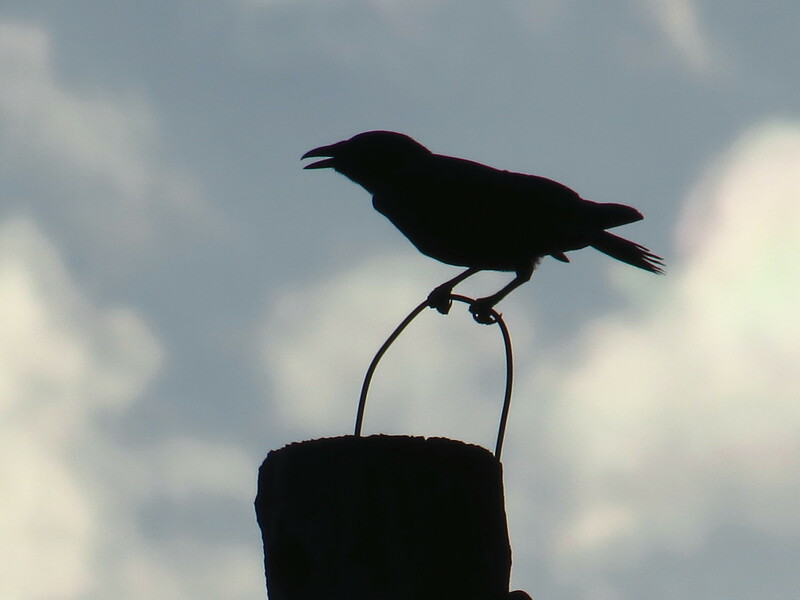 They have a high, warbling song. 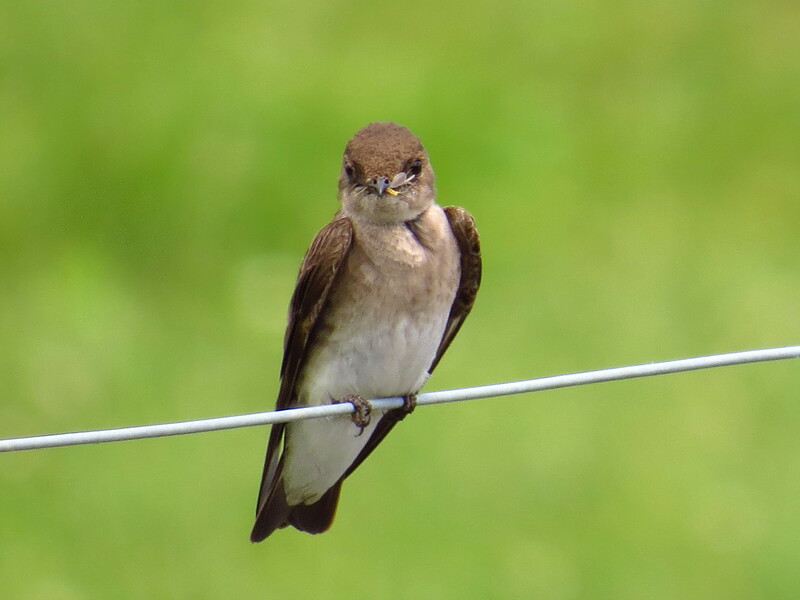 Found in thick undergrowth and scrubby fields, these birds have elongated slim, brown bodies with brown streaks on their underbelly and yellow eyes. 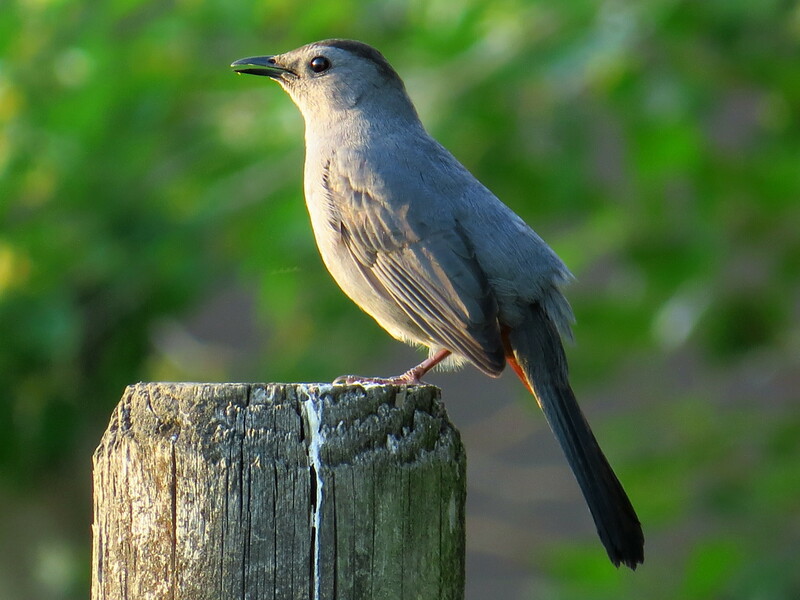 It is in the same family as catbirds and mockingbirds and has a nice repertoire of songs. season in spring and fall. 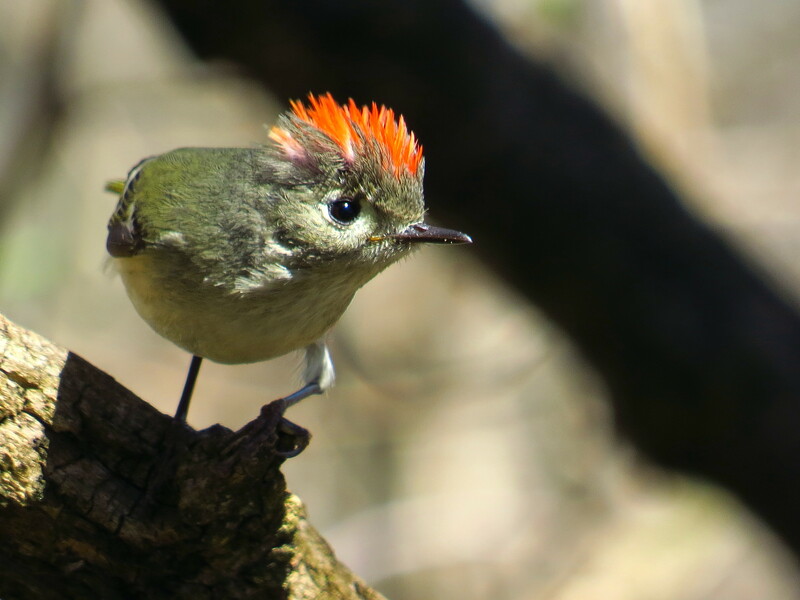 Males are a bright red and females are brown with a bright red crest and red markings on their bodies. Both have red bills. 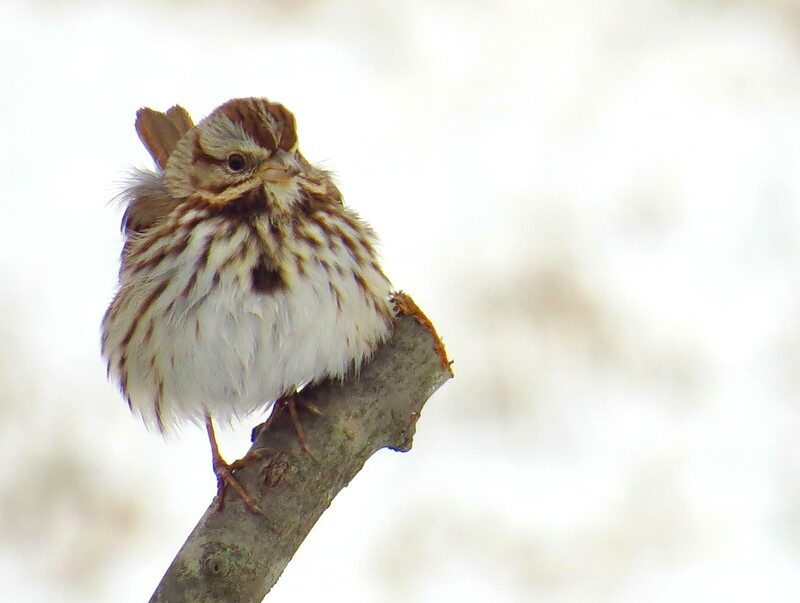 These songbirds do not migrate and do not molt, so they are easily spotted in winter. 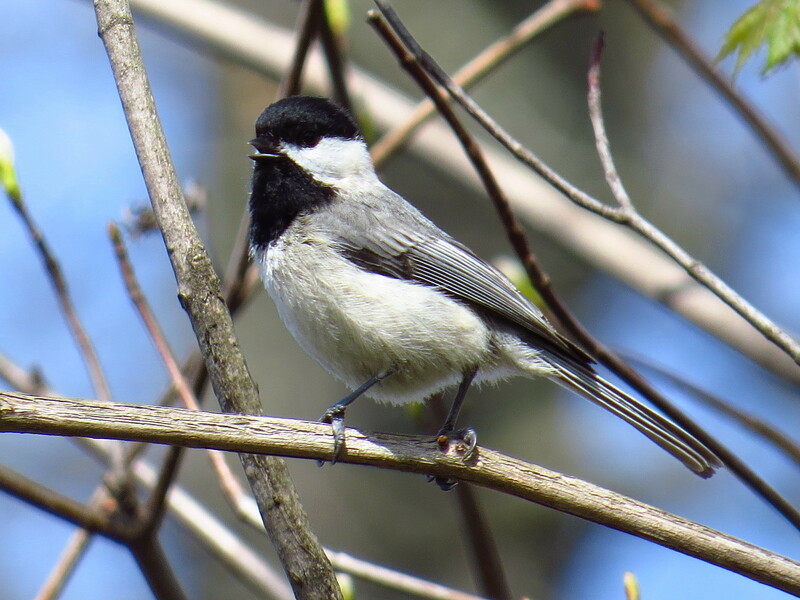 Easily confused with its northern relative–the black capped chickadee, this chickadee has more gray and less of a brownish-orange tinge. It has the black cap and bib, but the bib is framed by pale gray. 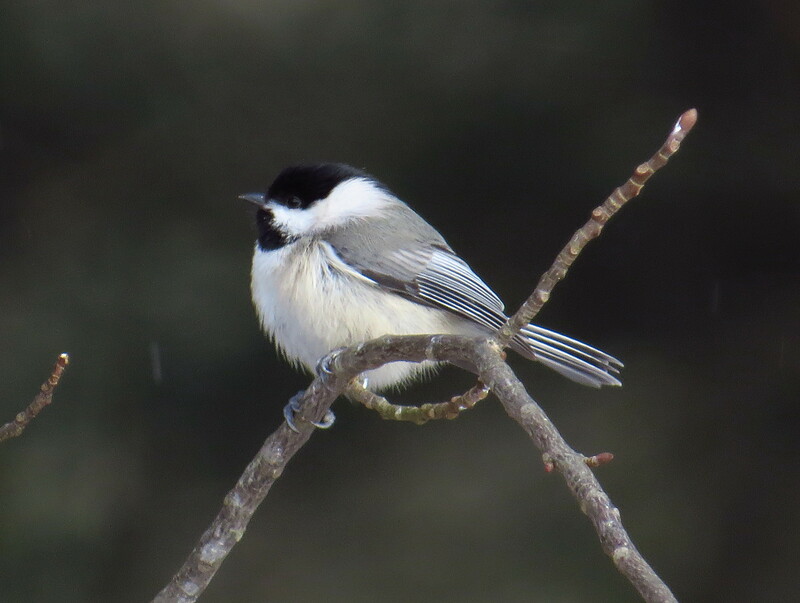 Sings a very quick chickadee-dee-dee. 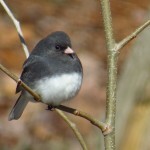 A small, chunky bird with a call that sounds like tea-kettle, tea-kettle is the color of a cinnamon stick, has a white eyebrow marking, and a proportionally long, upward-cocked tail. The underbody has an orange hue and the throat is white. It is often found in underbrush and dense vegetation. 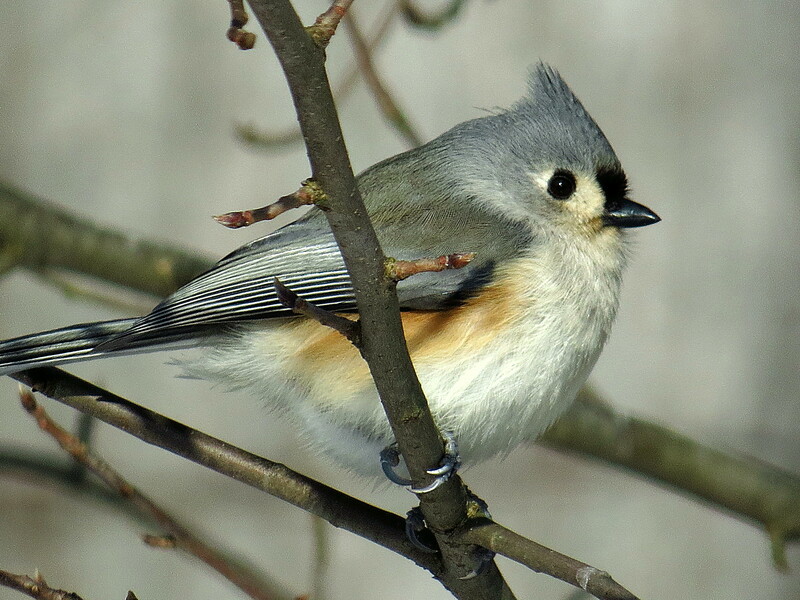 These little songbirds feed on seeds at ground-level, hide in the underbrush, and sing from the treetops. 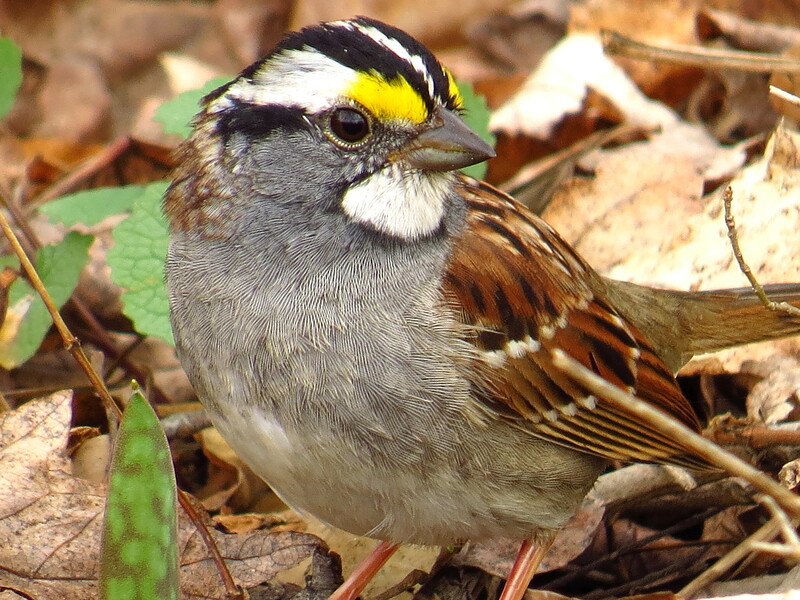 A distinctive, rust-color crest marks this predominantly gray throat and chest with a contrasting brown and black striped wings. The beak is tinged with pink, and there is a black stripe through the eye. 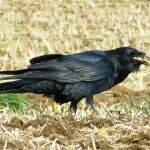 This sooty, black all-over bird is large with a thick neck, a long, double-edged beak and shaggy feathers around the neck. It travels alone or in pairs and has a gurgling croak. 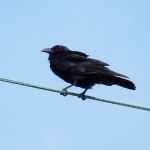 In flight, the raven is more slender than a crow. 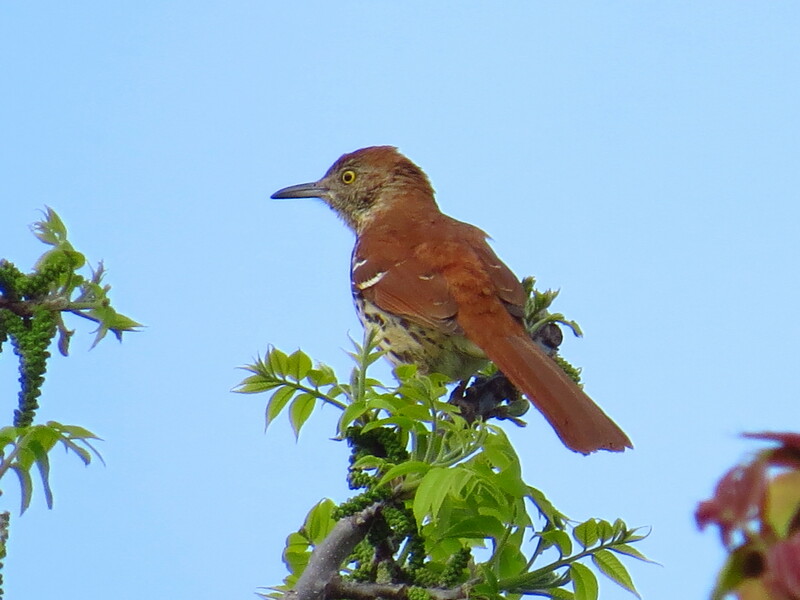 Found in woodlands, this bird preys on smaller birds. It is a steel-blue or gray with a reddish, rust-colored bar on the underbelly. 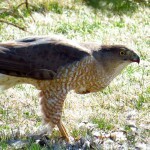 Immature Cooper’s Hawks are brown. It has a flap, flap, and glide flight pattern. When hunting, it may fly close to the ground and up over any obstacle before dropping quickly to strike its prey. 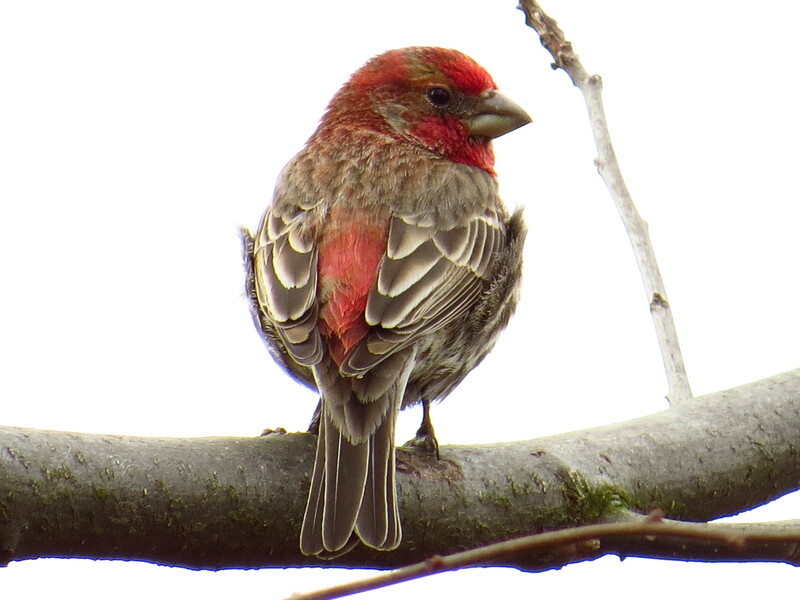 The male gender of this finch is red or pink and has a stocky body with a notched tail. 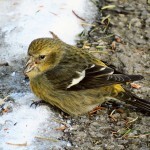 The female is a yellow-olive color with dark brown wings and tail. 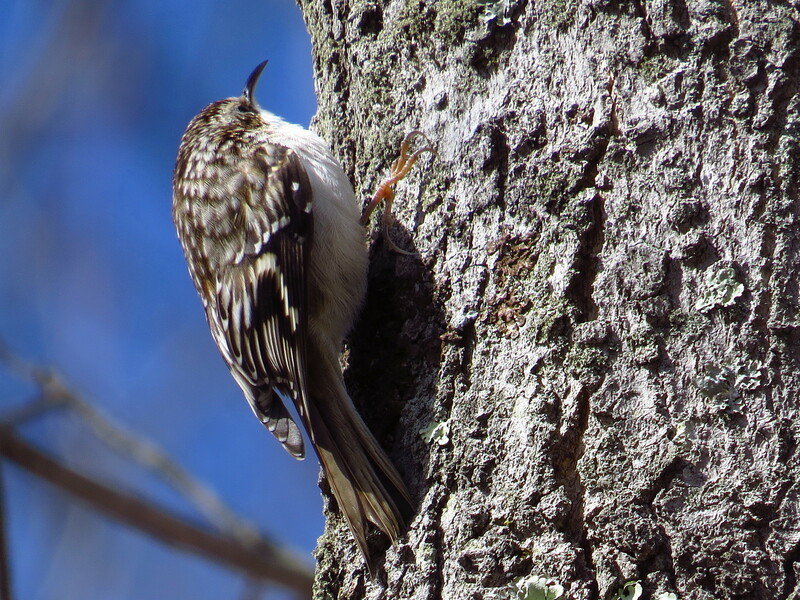 It feeds on seeds in the cones of conifers. Its call sounds like chut-chut-chut-chut. 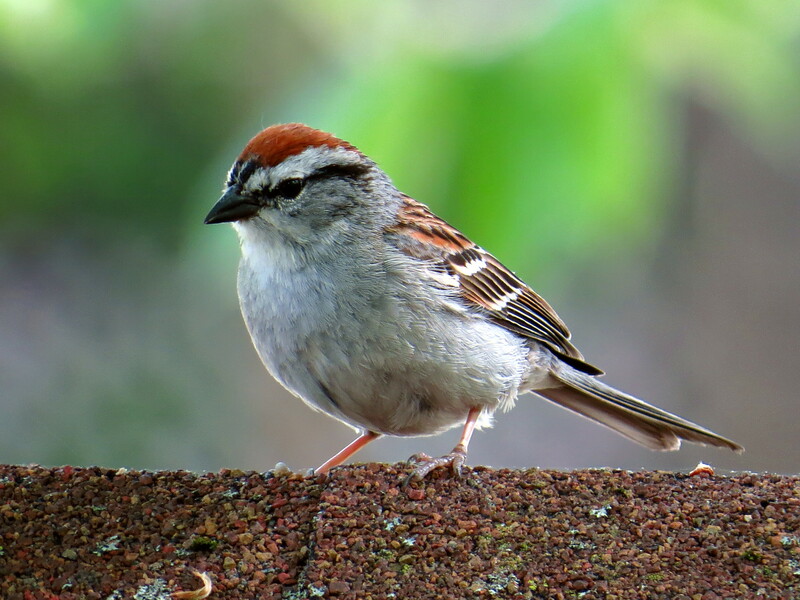 In the sparrow family, this bird is dark gray, slate, or brown with a white belly and a pink bill. 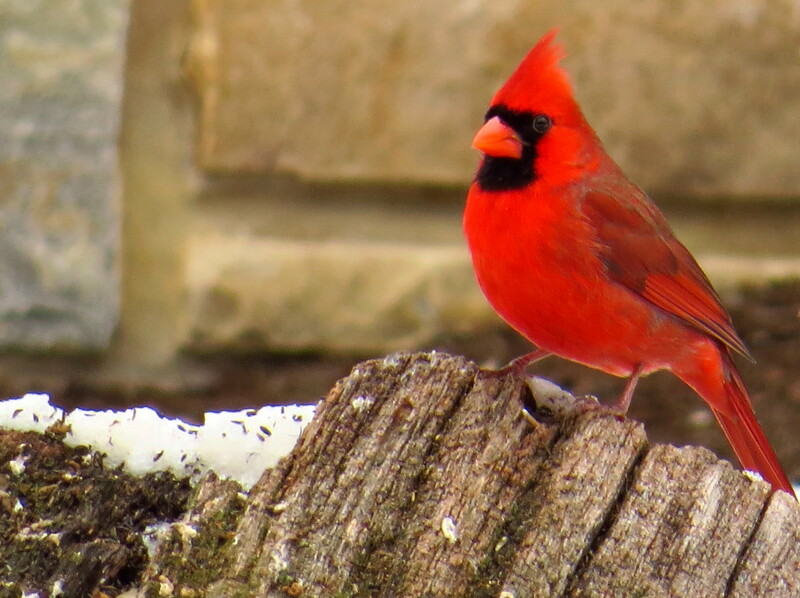 These birds are often seen hopping around the base of trees or shrubs foraging for seeds. 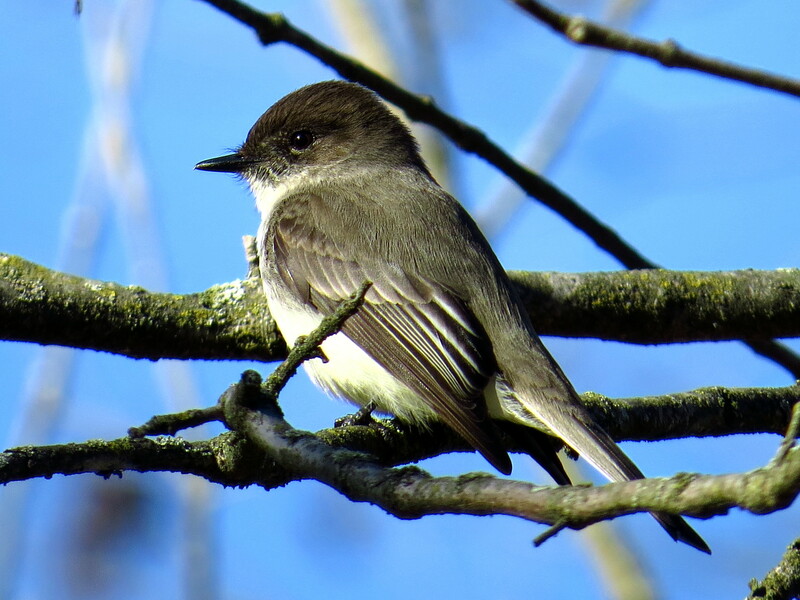 Named for the phoebe sound it makes, this bird is a small flycatcher with a dark head and a pale gray back and wings. It also makes a peep sound and as it sits wags its tail up and down. 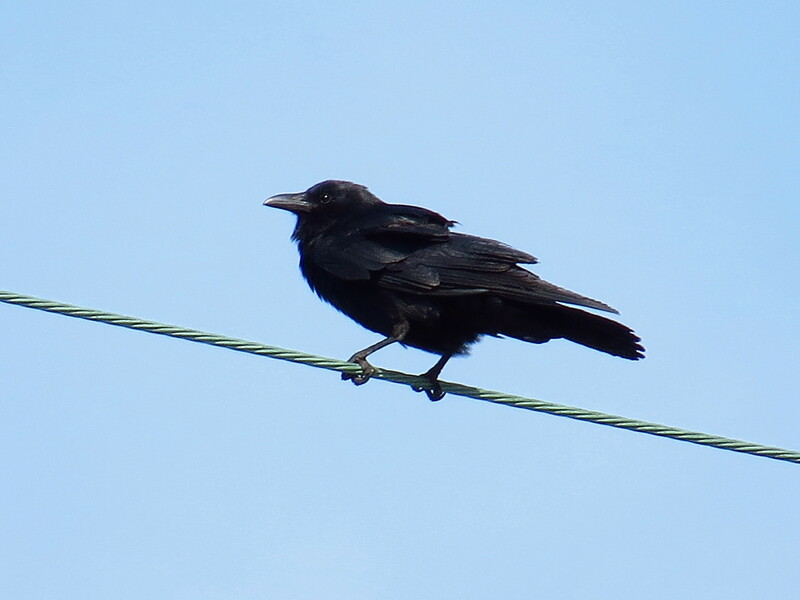 Looking much like the American Crow, this bird can be distinguished by its nasal calls. 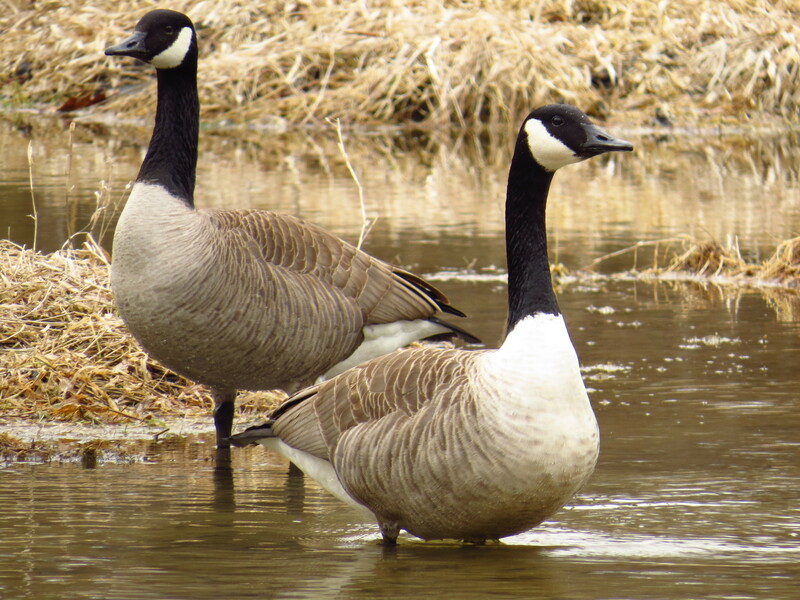 As they call, they puff out their neck and body feathers. 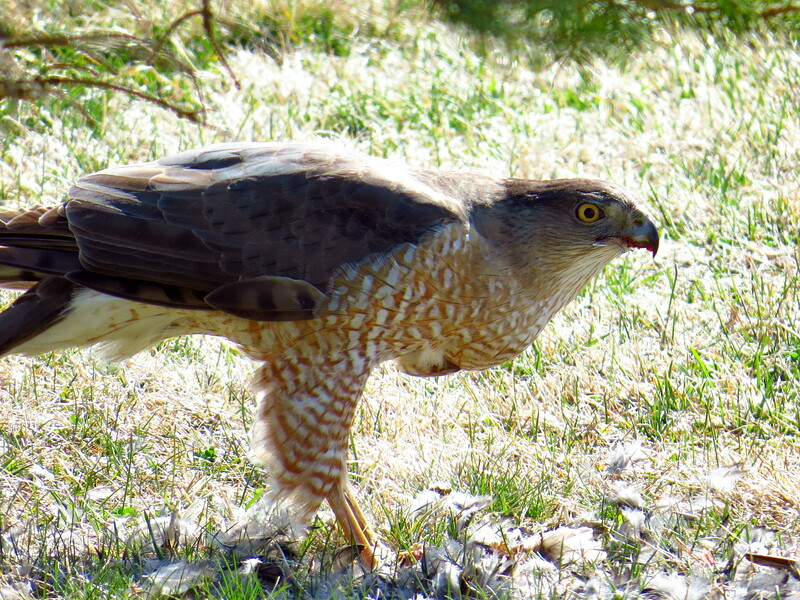 These birds also raid the nests of other birds, eating eggs. 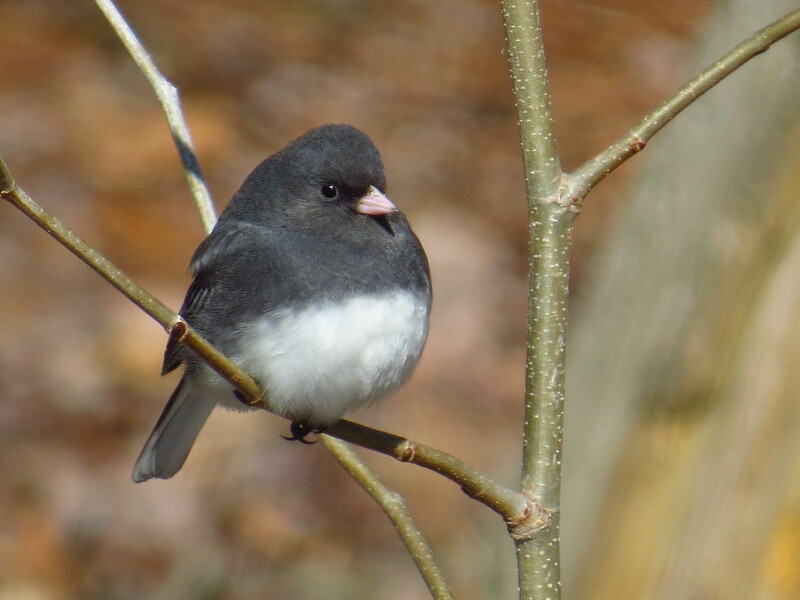 A slender, medium songbird with a gray body, a black cap, and rust-colored tail feathers makes a distinctive sounding “mew” and mimics other bird’s songs. It has a lot of energy, hopping from branch to branch in dense vegetation or making short, low flights. This large owl with tufts of feathers on each side of the head, yellow-orange eyes, and a deep series of four or five hoots is also known as a hoot owl or a tiger owl. 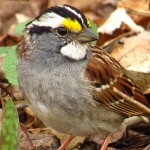 These birds are dappled gray and brown with ruddy brown faces and a white patch on the throat or chest. The female is larger than the male. 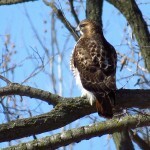 A very common hawk in North America, these raptors have cinnamon-red tails and brown bodies with white throat and chest. 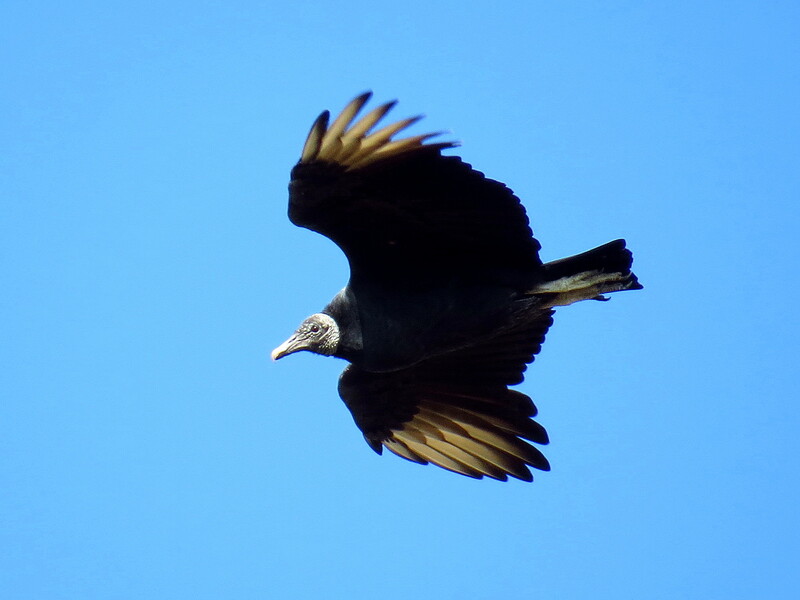 Soaring in circles, they attack prey with a slow dive and outstretched legs. 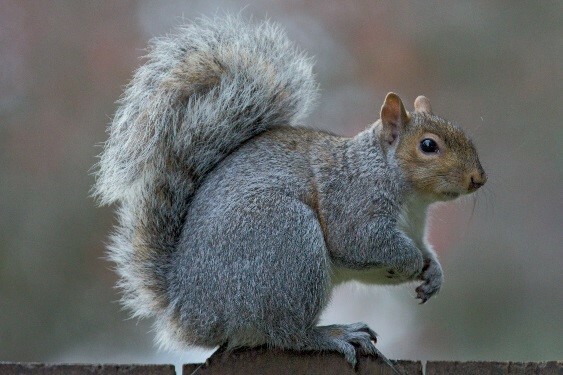 A medium brown with a reddish tail, a white chest speckled with brown spots, and a chunky body forages on forest floors for insects and leaf matter. It has a sad-sounding song, which is similar to “oh, holy, holy, ah, purity, purity, eeh, sweetly, sweetly. 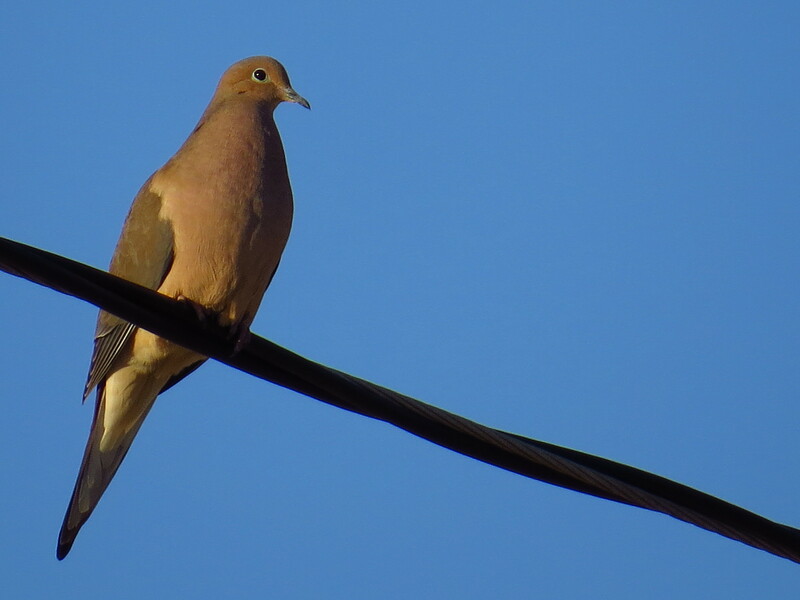 These birds have a chunky body and proportionally large, round head. 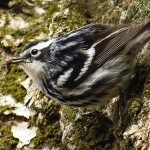 Males have a black bill, throat, and bib plus reddish wings with black streaks and a white stripe. 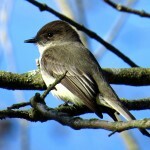 Females are gray on the underside and brown on the top-side with dark streaks on the back and wings. 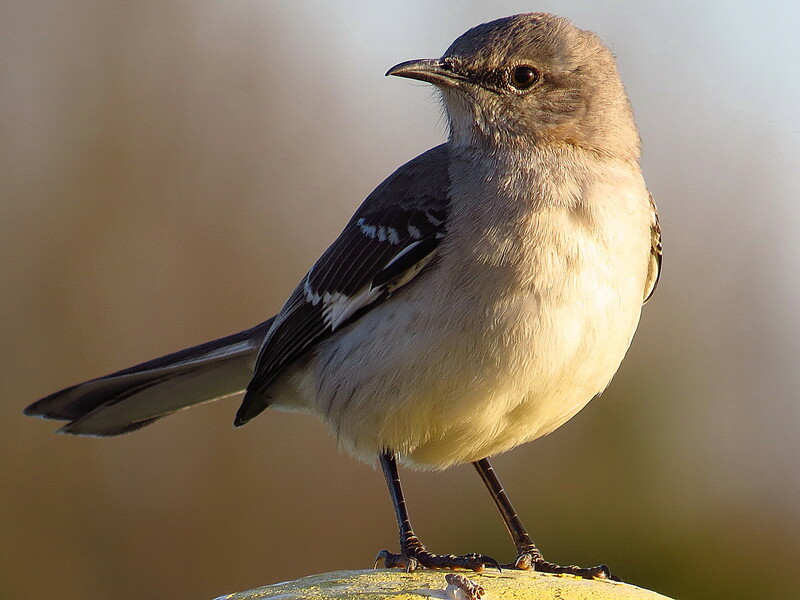 This seed-eater gravitates to pine trees and can be identified by the yellowish color and white bars on gray wings. Females can be gray-brown. Both have a notch in the tail. 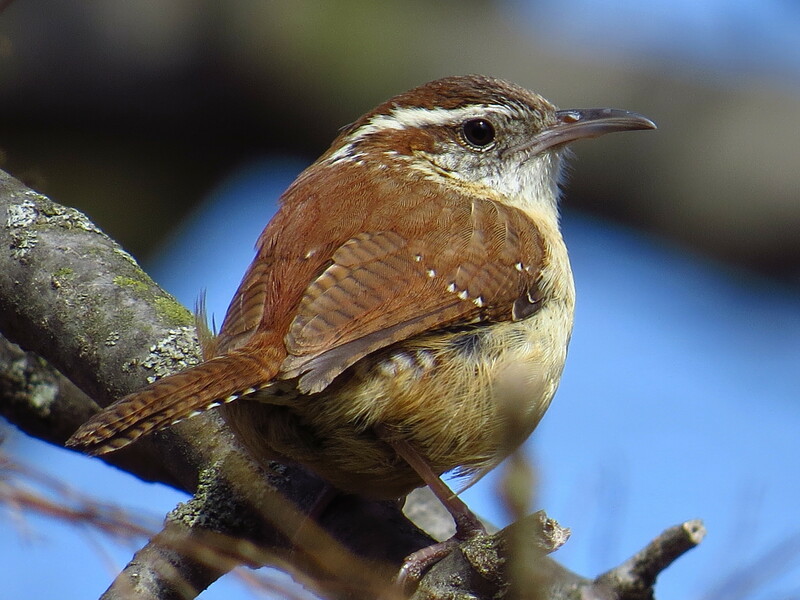 This songbird is simple brown color with small points on the edges of the outer wing feathers. It has long, pointed wings and a small bill. 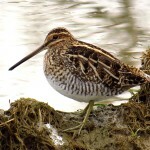 These birds flit through dense vegetation in short flights. A downward pumping of the tail is a noticeable feature. It is colored brown and gray with a white chest. Thick, brown streaks across the entire body are a distinctive feature. 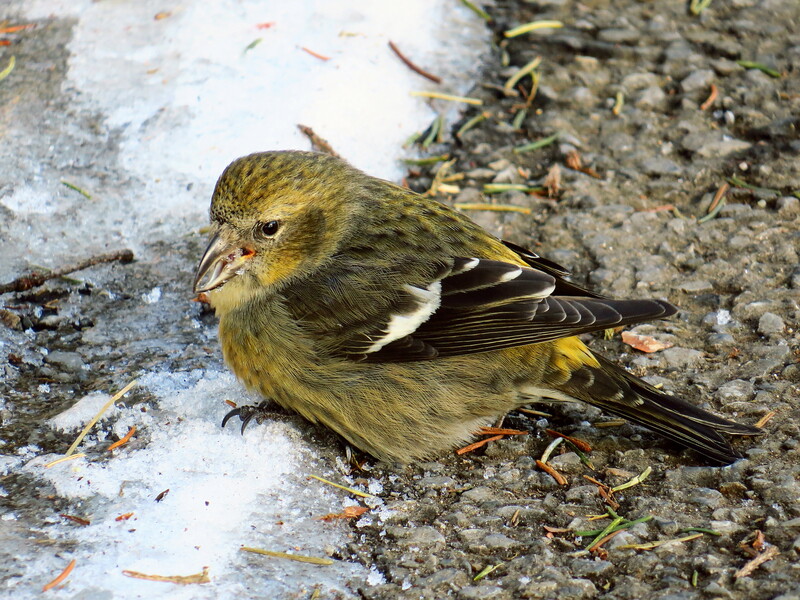 A tiny, chubby bird with much energy can be identified by its constant wing-flicking. 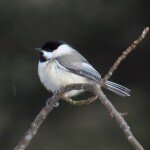 It is smaller than a warbler or chickadee, an olive color across the body, and bright yellow-green markings on the wings. 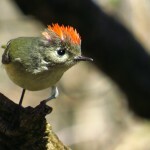 The male has a bright red crest, which it exposes when upset. 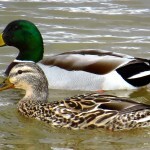 A very familiar duck, males of the species have an iridescent green head and a bright yellow bill. 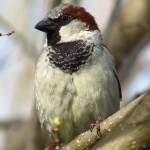 Females are speckled brown with orange bills. 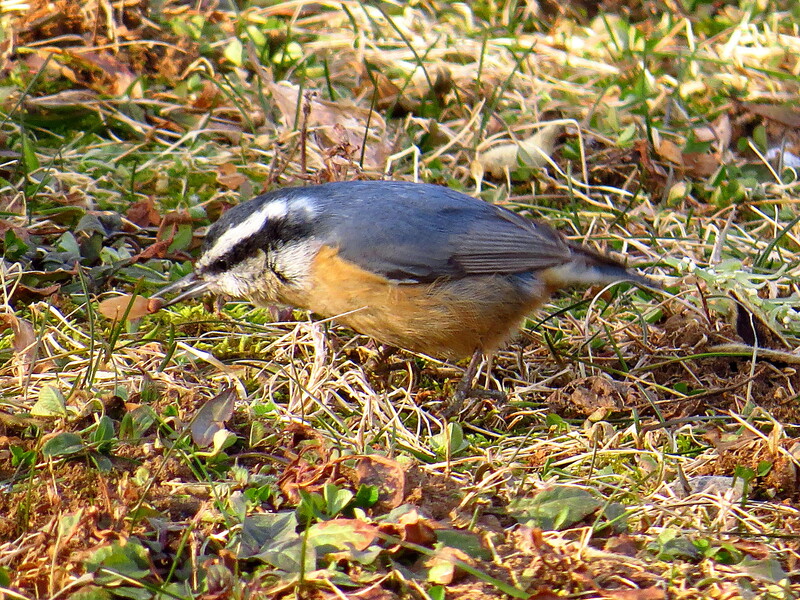 This medium-sized songbird is overall gray-brown and paler on the under-belly. It has a white patch on each wing and white outer tail feathers, both of which are good identifiers when the bird is in flight. 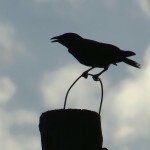 It is a mimic, copying the sounds of birds and frogs, creating a long series of repeating songs. 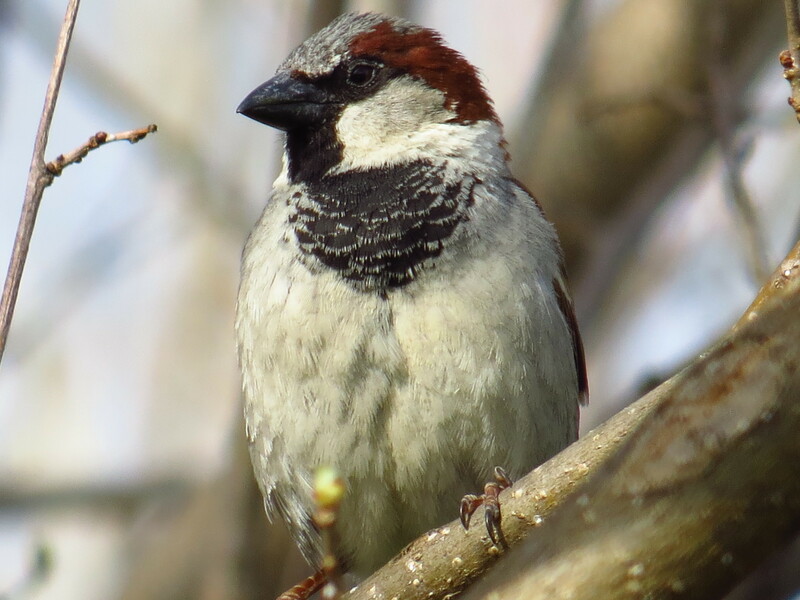 This plump bodied, small-headed bird is light brown or tan with black spots on the wings and black tips on the tail feathers. Its flight is fast and straight. Their song and calls are coos, soft and sad. In flight, the wings are short and point and look like a small, four-pointed star; hence the name starling. 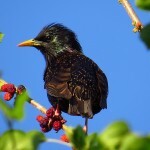 In summer, these birds are an iridescent purple-green. 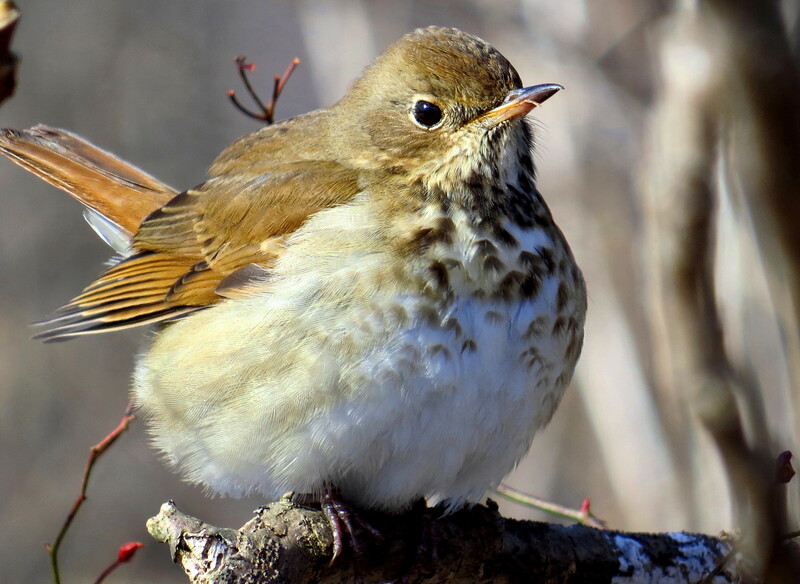 In winter, these birds are brown with bright, white spots. 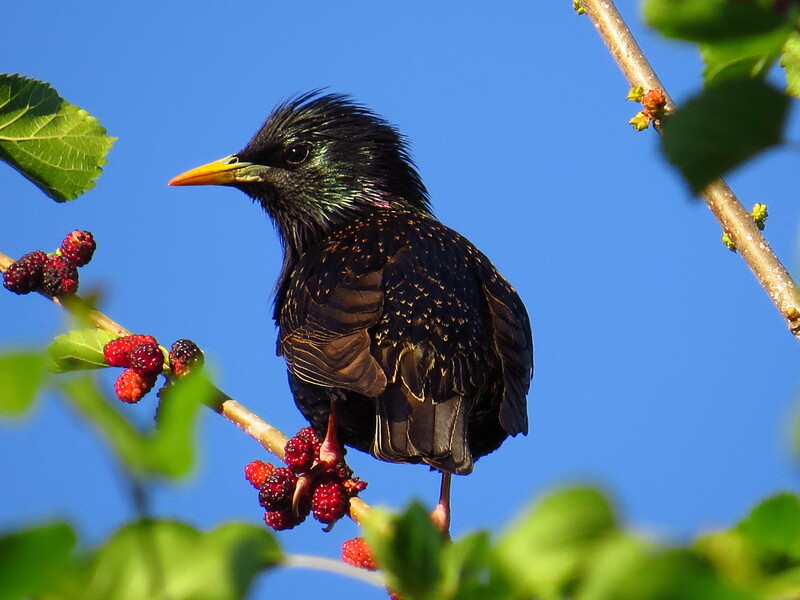 Starlings are noisy and travel in groups. These stocky birds with long, pointed wings are elegant fliers and fluid singers. 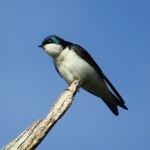 The males are blue-green on the topside and wings, white on the underbelly, and have a thin black mask around the eyes. 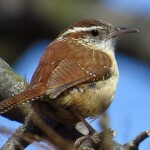 Females have a duller brown on the top of the body. 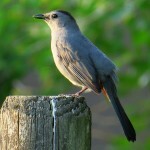 This is a small, silver-gray bird with a light orange color through its flanks, a pointed crest, and a short, stout black beak. It has a distinct whistle, which sounds like peter-peter-peter. 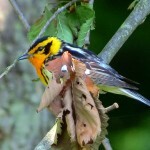 The throat and breast of the male is deep orange with yellow around the eyes, a black crown, black wings and tail feathers, and thick white bars on the wings. Females are similar but not as vibrant. 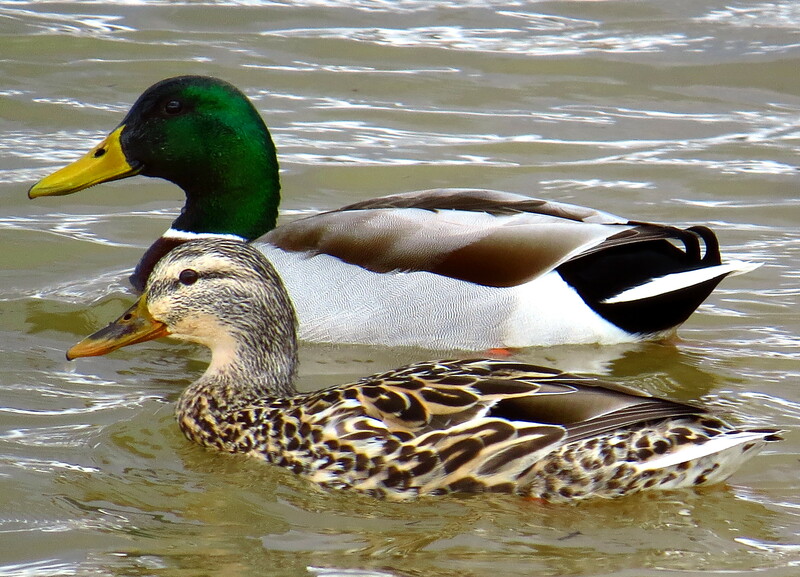 Both are most vibrant in breeding season. It is known for high-pitched song, which sounds like zip,zip, zip,zip, titititi, tseeee. 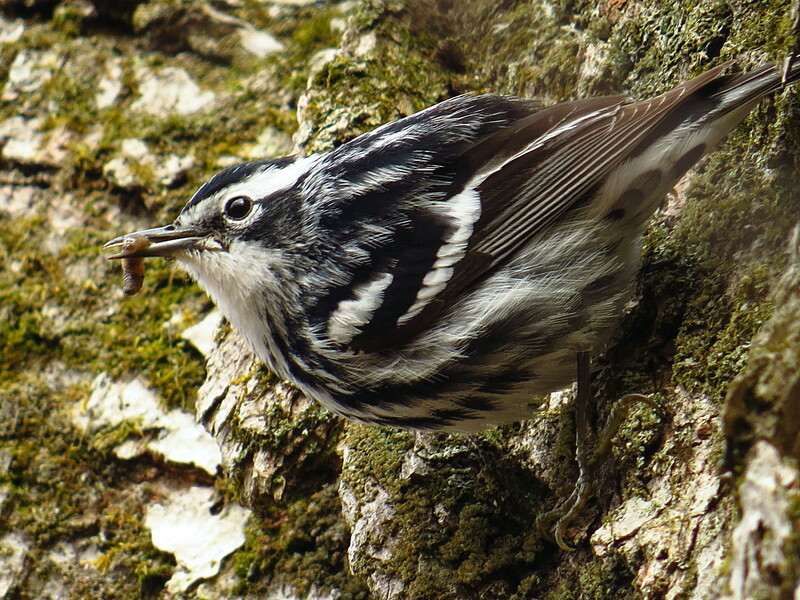 These little songbirds are boldly striped black and white. The stripes of males are the boldest; the females are paler and may have tan around the flanks. 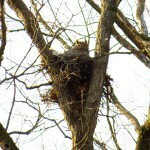 It is an insect-eater, crawling up and down on trees; it nests on the ground. 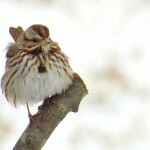 These birds have brown and tan patterned stripes and bars with a beige chest spotted with brown. 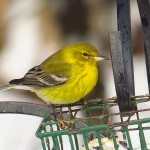 It appears as pudgy and has a long, straight bill. Its flight is a fast, zig-zag. 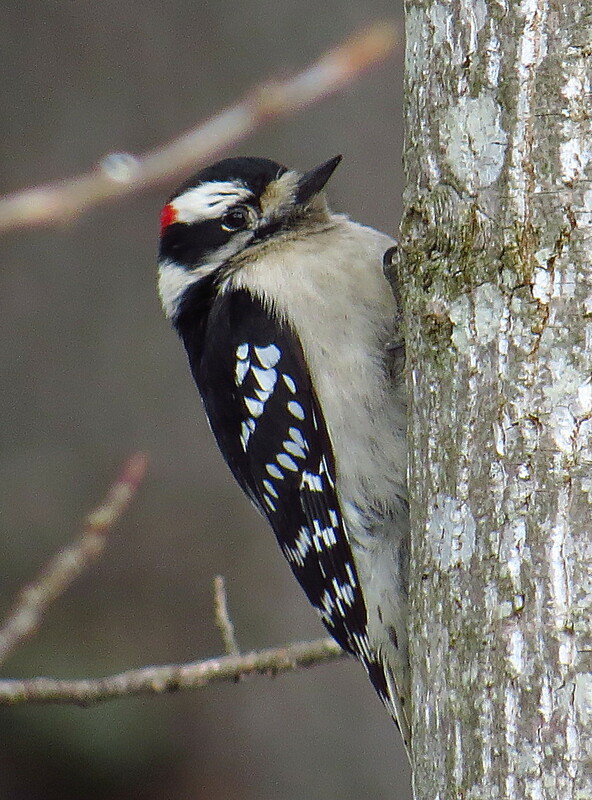 The smallest North American woodpecker appears to be black-and-white checked with a striped head. 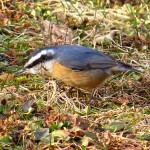 The male has a small red patch. It has a chisel-like bill and block head. 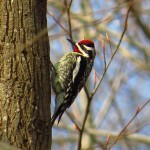 A medium-sized woodpecker is larger than a Downy Woodpecker. 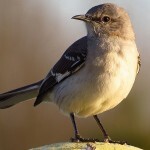 It has a larger bill, nearly the same size as the head, black wings checkered with white, and a large white patch down the center of its black back. 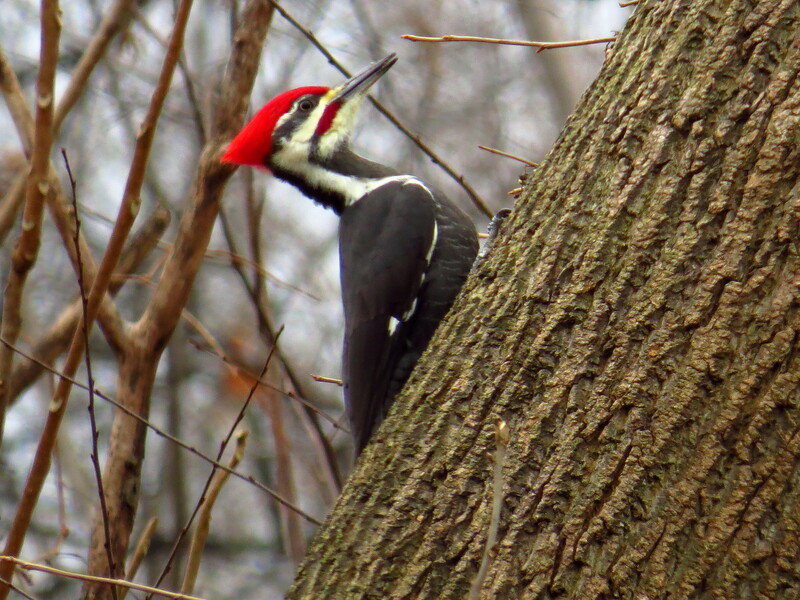 A large-sized woodpecker is the size of a crow. 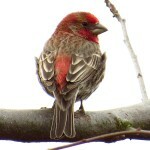 It is black with a white strip from the neck to a very red crest. Males have a red stripe on the cheek. In flight, the white underwings are visible. 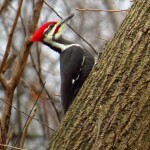 The main food of this woodpecker is the carpenter ant. 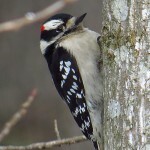 It is a medium-sized woodpecker, close in size to the Hairy Woodpecker. 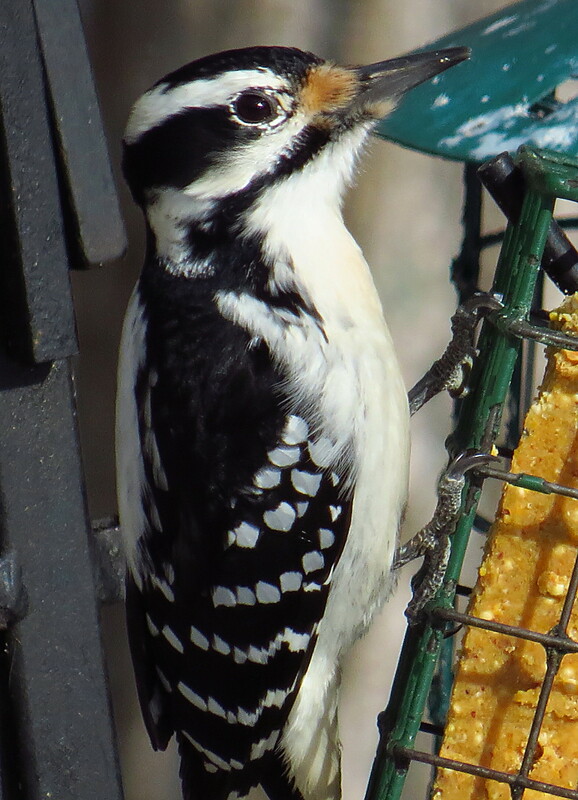 It has a sleeker appearance than the more blocky Hairy Woodpecker. 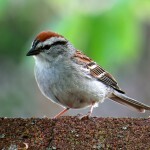 Males are brownish-gray one the underside, black-and-white striped on the top-side, and a red forehead, cap, and nape. The most common calls are kwirr or churr and a rough-sounding cha, cha, cha. 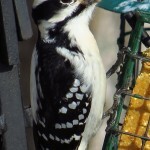 This is a small-to-medium woodpecker with black and white patterned faces, a yellow or white underside, and black and white stripes curved toward the chest. Both genders have red foreheads. 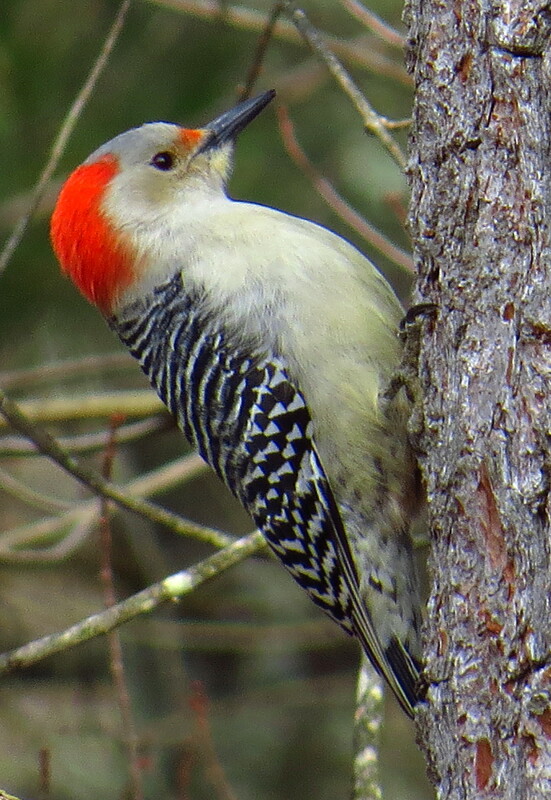 Males also have red throats. 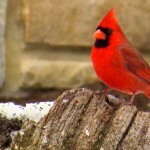 These birds feed on tree sap and insects. 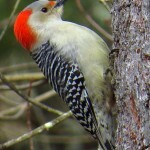 The noise of its drumming is slower and more irregular than other woodpeckers. 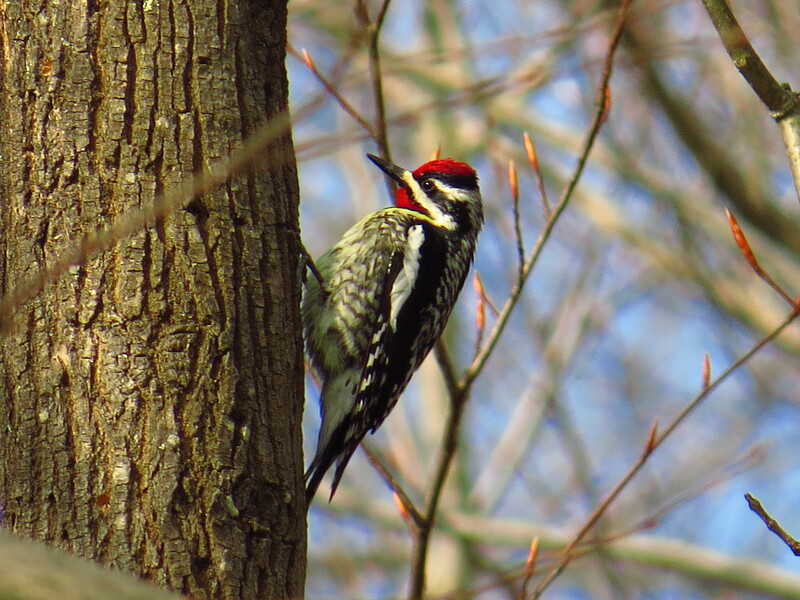 The Out of the Ore: Birds and Blooms walking trail is situated in the South Mountain area of Pennsylvania and is part of more than 85,000 acres of Michaux Forest, comprised by the land once owned by the Mont Alto Ironworks, Caledonia Ironworks, and Pine Grove Furnace. The old growth forest was burned to make charcoal to operate the iron ore furnace. Today, the forest surrounds the meadow areas where the iron ore furnaces worked decade after decade. In spring, thawing snow and rain create vernal pools between the Birds and Blooms Trail and the nearby Bricker Clearing Trail. The vernal pools support diverse aquatic lifeforms, such as fairy shrimp, water fleas, diving beetles, water mites, and water striders. Dragonflies and damselflies feed on larvae in the pool, and damselflies lay eggs in the pools. Wood frogs and spring peepers can be spotted around the pools as well as their eggs and tadpoles in the pools. 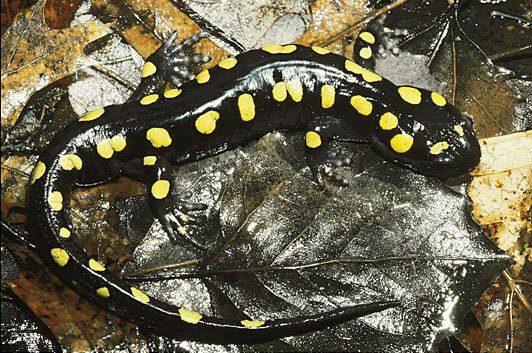 Other amphibians can spotted, including spotted salamanders and marbled salamanders. Plentiful amphibians in spring and rodents year-round make this a habitat for garter and black snakes. Abundant sunshine in the fall is another attractive feature of the area around the trail. Garter snakes, black racer snakes, and black rat snake are non-venomous snakes of the area. 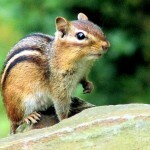 Small to medium mammals are home in the underbrush of the wooded spaces next to the trail. The proximity of open space to areas of coverage makes this location a good one for a variety of animals. The habitat is well-suited to eastern cottontail rabbits, groundhogs—also known as woodchucks, northern short-tailed shrew, southern red-backed vole, white-footed mouse, woodland jumping mouse, eastern gray squirrel, eastern chipmunk, eastern fox squirrel, coyotes, foxes and white-tailed deer. 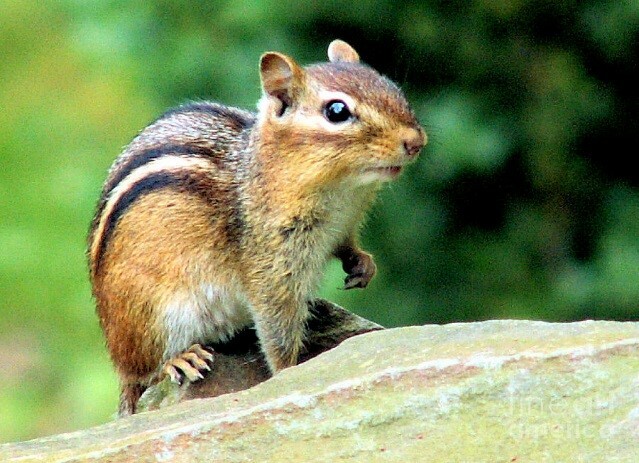 On each of its sides, the eastern chipmunk has a white stripe banded with a black stripe and a black strip in the middle of the back. It eats seeds, nuts, fruits, plants, mushrooms, insects, and worms. 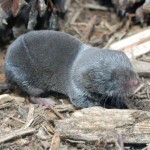 It stores food and transports it to its burrow using the pouches in its cheeks. 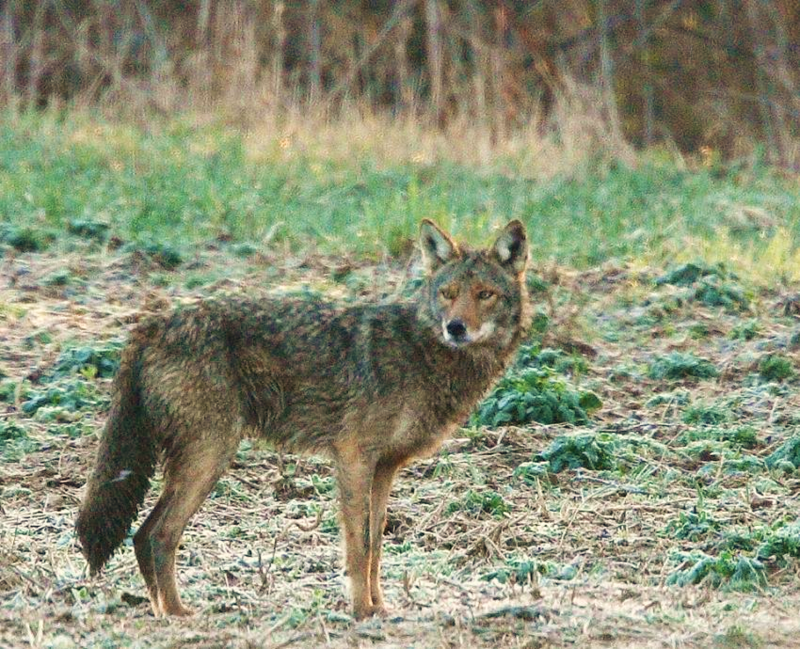 The body of a coyote is more dog-like and larger than a fox. It runs up to 43 mph. Like the fox, it is omnivorous, eating a variety of foods but is a pack-hunter. 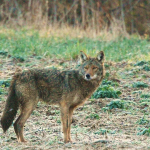 At night, coyotes communicate in yips, barks, and howls. 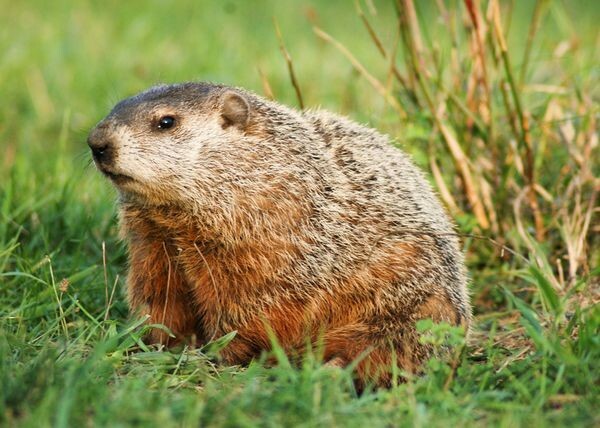 It is the most abundant and visible large mammal in Pennsylvania. The species is brown in summer, getting a grayer shade in winter but always with a white undertail. 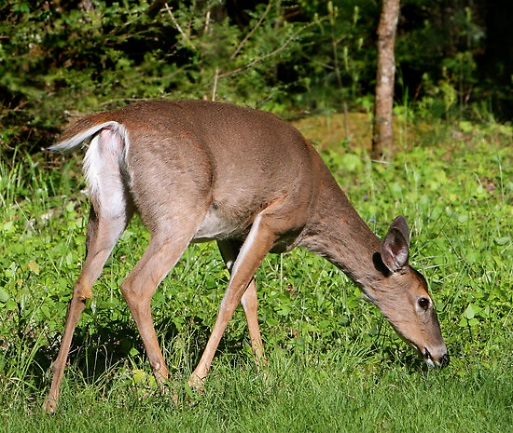 Predominantly an herbivore, whitetails eat plants, leaves, bulbs, grasses, fruit and acorns as well as corn and other farm crops. It is attracted to this area by the nearby apple orchard and corn fields. An adaptive mammal, it can live easily near residential areas. 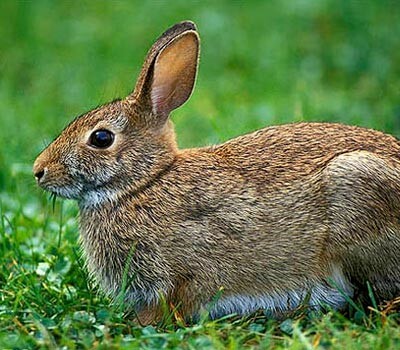 It is about 3 ft. long and 2 ft. tall with large, pointy ears, long snout, and long, fluffy tail. 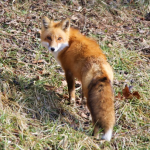 Sometimes confused with a gray fox because both can have red and gray fur, the tail of a red fox is white. 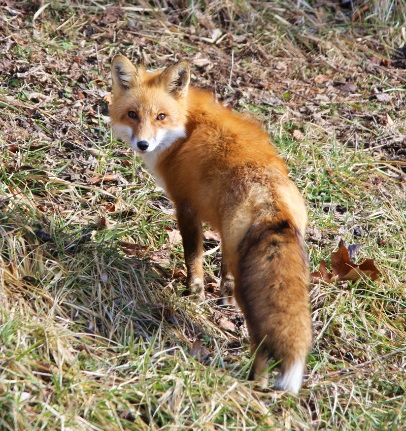 Foxes are omnivorous, eating such varied foods as fruits, grasses, tuberous roots, birds, mice, and rabbits. 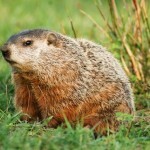 A groundhog is a large, hibernating rodent. 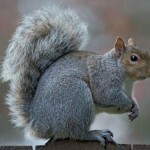 It is actually the largest member of the squirrel family, although it lives on ground and hibernates underground. 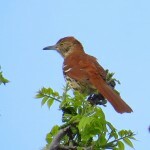 It is primarily a grass and berry-eater but does eat insects occasionally. 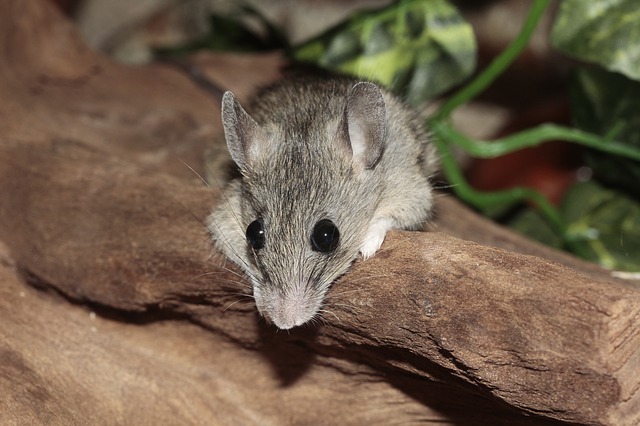 These rodents can be gray, brown or reddish and are white on the underside with large ears and long tail. It is an omnivore, eating seeds, berries, nuts, insects, and fungi and has been known to eat up to 30% of its body weight. 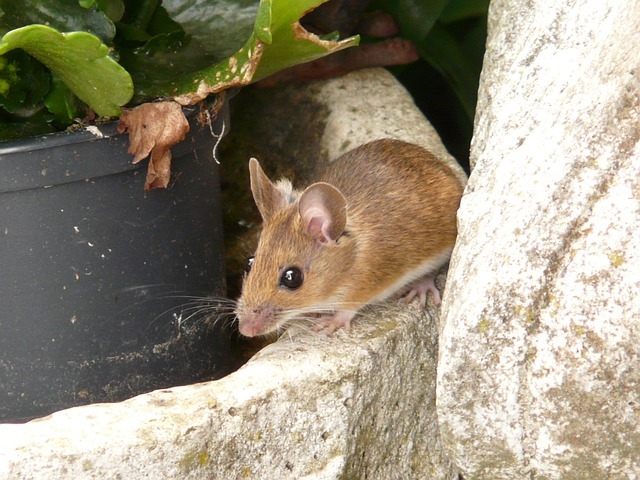 The small rodent has a yellow-orange hue to its fur, a tail more than 50% of its body size with a distinctive white tip, and over-sized back legs to support jumps in excess of 5 feet. 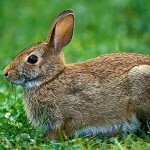 The location allows the eastern cottontail to be out in the open and quickly dart into a good hiding place. 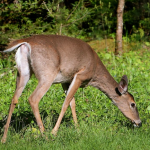 It forages for bark, leaves, twigs, fruit, buds, flowers, and seeds. 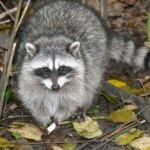 This medium mammal is covered with gray fur and sports a distinctive black mask and black bands on its tail. 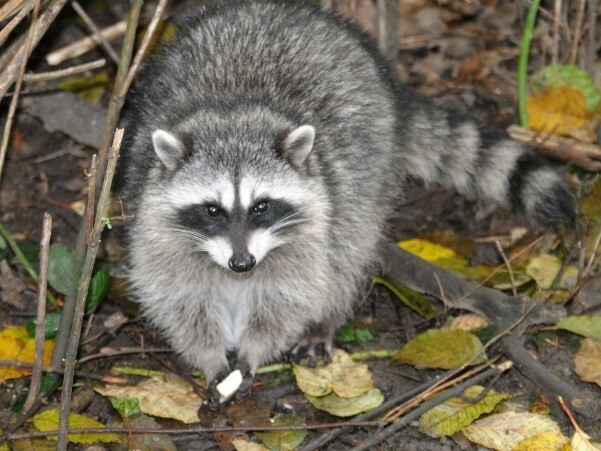 An omnivore, the northern raccoon has a diverse diet, eating easy-to-catch vertebrates, invertebrates and plant life. It likes the safety a quick run up a tree affords. 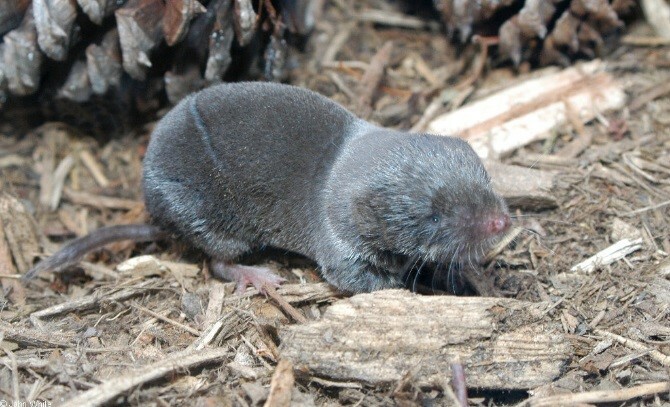 This shrew likes grassy areas and areas with wet leaf matter. It eats fungi, seeds, mice, snails, and earthworms—making the habitat around the vernal pools quite desirable. 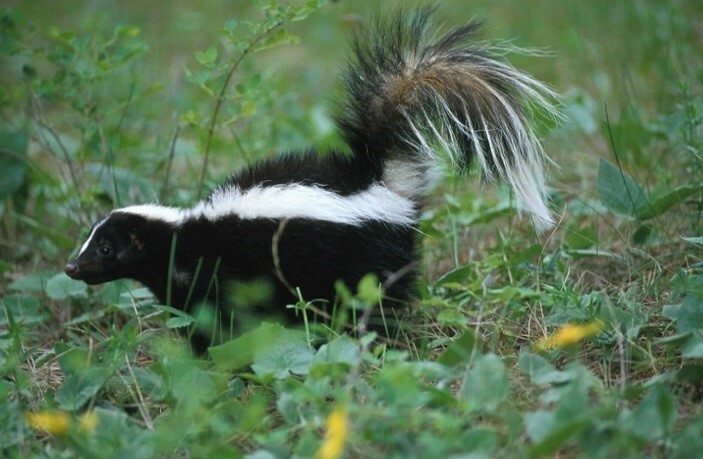 About the size of a cat, the striped skunk has a black body with two white stripes, joining together near the nape of the neck. 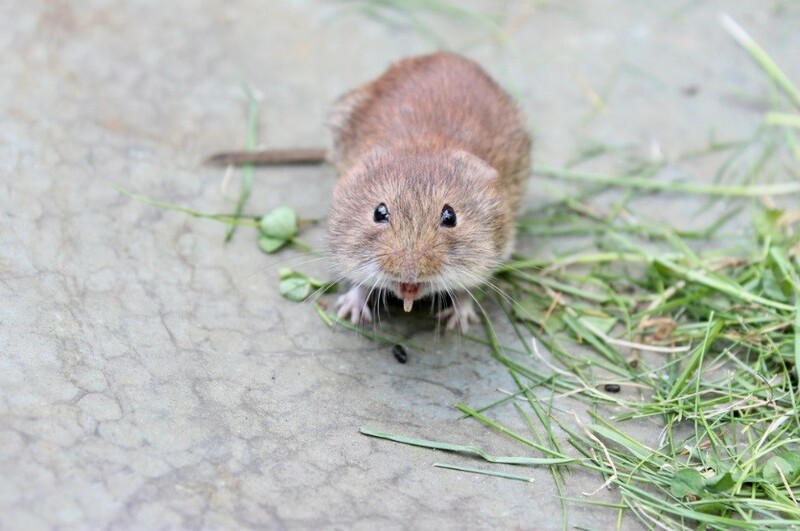 It is an omnivore, eating insects, nuts, bird eggs, mice, and voles. 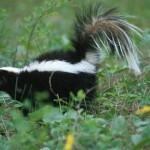 It is best known for its distinctive odor. This tree squirrel is typically gray but can also be brown with a white underside. 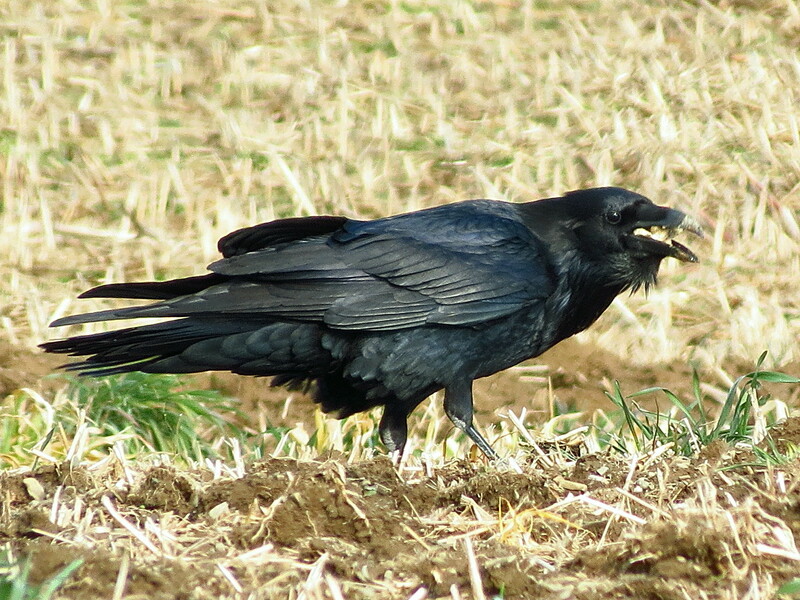 It is a hoarder, hiding seeds and nuts for later retrieval. It eats tree bark, tree buds, berries, seeds and nuts. 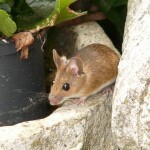 Look for the ruddy band along the back and a short tail to identify this small rodent. 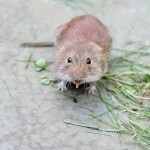 Voles are chubbier than mice and have rounder heads. It eats nuts, seeds, fungi, plants, insects, and snails and will store bulbs and roots to eat later. Its predators are hawks and owls. Colonial America was fueled by forests and water. By the middle of the 18th century, iron ore production was a leading colonial export, behind wheat and wood. To manufacture the iron ore, a furnace stack was filled with rocks containing iron ore, charcoal, and limestone. The furnace heated the contents to a high temperature. Water powered a bellows, which added bursts of air to increase the burn. The charcoal and limestone helped to separate the impurities, which floated to the top of the molten mass. This impure substance was called slag, which can be found at the former furnace sites even today. It has a glassy appearance and is a dark color. Ore was heavier than the slag and could be run off into troughs or molds, which looked like a mother pig nursing her piglets. The name “pig iron” is derived from this visual. Colonial ironworks were important to the success of the Colonial quest for independence during the Revolutionary War. By the eve of the American Revolution, America was producing about 1/7 of the world’s total iron, and Pennsylvania contributed nearly 20 blast furnaces. Though the early American ironworks helped to forge the next phase of America’s development—the industrial revolution, the methods of extracting iron from ore changed in the second half of the 19th century and the furnaces of South Mountain ceased production. 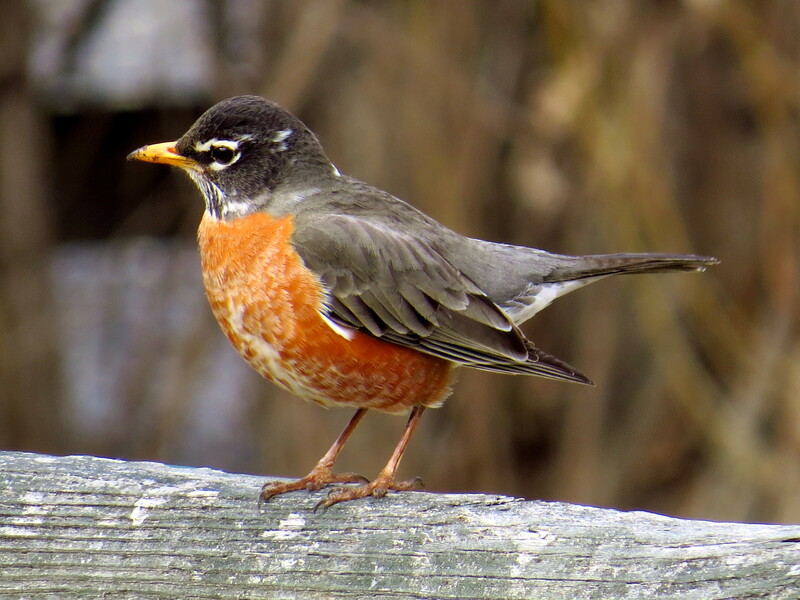 Out of the Ore: Birds & Bloom Walking Trail is located off Route 997 on Orchard Drive. The Out of the Ore: Birds & Blooms Walking Trail project was financed in part by a grant from the Community Conservation Partnerships Program, Environmental Stewardship Fund, under the administration of the Department of Conservation and Natural Resources, Bureau of Recreation and Conservation. The grant was awarded through the South Mountain Partnership, with management oversight of the Appalachian Trail Conservancy. The Franklin County Visitors Bureau and the Penn National Golf Course and Golf Course Community are partners of the South Mountain Partnership, an alliance of organizations working to preserve and enhance the cultural and natural assets of the South Mountain Landscape in Central Pennsylvania. To learn more about the Partnership, please visit www.southmountainpartnership.org. Special thanks to the Franklin County Historical Society and Conococheague Audubon. Out of the Ore: Birds & Blooms Trail invites you to enjoy nature. Please remember you are visiting and leave no trace, except footprints.